There are many Ancient Mysteries, Haunted Yorkshire have listed some of these below! Andros is the largest of the Bahaman Islands, south of Bimini, where an underwater feature discovered in 1969 has been associated with Atlantean civilization ever since. Floridians Dr. Gregory Little and his wife, Lora, found a sunken site in Nicolls Town Bay, near the extreme northeast end of Andros 34 years later. They learned of its general position from a former dive operator, Dino Keller, who claimed to have navigated his boat inside a coral reef usually approached on the outside. There, in 1992, Keller observed a large structure similar to the so-called “Bimini Wall,” under some 10 feet of water. Following Keller’s directions, in March, 2003, Dr. Little snorkelled about 600 yards from shore to find a 1,375-foot long, 150-foot wide arrangement of cyclopean blocks in three well-ordered sloping tiers interspersed by two bands of smaller stones. Although standing 15 feet beneath the surface, its top section is 10 feet deep, as described by Keller. The large stones comprising the tiers average 25 × 30 feet, and 2 feet thick. Each of the three tiers is 50 feet wide. Some suggestion of a ramp was discerned leading from the floor of the harbour lagoon to the top of the platform. The feature’s regular appearance and almost uniformly square-cut blocks, given its location at a natural harbour in the North Atlantic Current, suggest it may have been a quay, breakwater, or port facility of some kind. Underscoring this characterization, together with the ramp, are a number of 5-inch wide and deep rectangles resembling post-holes cut into some of the cyclopean stones just below the uppermost tier. These holes may have held mooring pylons used to tie up docked ships. Most if not all of the blocks themselves appear to have been quarried from local beach rock and deliberately set in place, a marine construction practice common in the ancient Old World. Dr. Little believes the formation could only have been built 10,000 years ago, when sea levels were low enough for its creation. But archaeologists are certain that nothing of the kind existed in the post glacial epoch. Sea levels would have dropped sufficiently, however, between 1600 and 1500 B.C., during the middle to late Bronze Age—a far more likely period for construction, if only because similar harbour works were already in use throughout the eastern Mediterranean by that time. Moreover, Lake Superior copper mining was simultaneously nearing the zenith of its output. A port located off the North American coast, situated in the heart of the North Atlantic Current, would have been a valuable asset for freighters carrying cargos of mined copper back to their headquarters in Atlantis. An Atlantean connection is, after all, suggested in the Andros platform’s six alternating bands of stone: 6 was the sacred numeral of Atlantis, whose cityplanners incorporated the holy number in the capital’s alternating stone walls, according to Plato’s description of the sunken civilization. Cleito gave birth to five sets of twin boys who became the first rulers of Atlantis. The island was divided among the brothers with the eldest, Atlas, first King of Atlantis, being given control over the central hill and surrounding areas.At the top of the central hill, a temple was built to honor Poseidon which housed a giant gold statue of Poseidon riding a chariot pulled by winged horses. 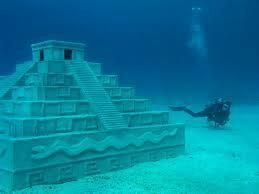 It was here that the rulers of Atlantis would come to discuss laws, pass judgments, and pay tribute to Poseidon. Plato was a student of Socrates until the latter's death in 399 BC at the hands of the Athenian authorities. After his teacher's death, Plato traveled extensively, including journeys in Egypt. In 387 BC he returned to Athens and founded the Academy, a school of science and philosophy, that became the model for the modern university. Perhaps the most famous student of the Academy was Aristotle whose teachings have had tremendous impact on philosophy through today. Due to the Academy's safekeeping, many of Plato's works have survived. His extant writings are in the form of letters and dialogues, the most famous of which is probably The Republic. His writings cover subjects ranging from knowledge to happiness to politics to nature. The Bermuda Triangle has been a topic of hot discussion and interest for many years because so many strange occurrences have taken place in this area of the world that lies between the southern eastern coast of the United States and the islands of the West Indies. Basically, if you draw a line from Miami to Puerto Rico and Puerto Rico to Bermuda and then Bermuda back to Miami you would have the area that is known as the Bermuda Triangle. Many boats, airplanes, and ships have mysteriously disappeared in the Bermuda Triangle with no explanation for what happened to the crafts or the individuals on board. In the past 100 years, more than 1000 lives have vanished in the Bermuda Triangle. For many years individuals attributed the disappearances and strange events to extraterrestrials or aliens because there simply was no other explanation for what was happening in this area of the world. In fact, in 1974 Charles Berlitz wrote about the mysterious Bermuda Triangle in a book that sold almost 20 million copies in more than 30 languages. This is because the entire world is intrigued by the unknown that is the Bermuda Triangle. However, the unknown of the Bermuda Triangle does have some explanations other than extraterrestrials or aliens flying down and snatching up boats, ships and airplanes. Some simply say that accidents happen and while some of those accidents occurred in what is known as the Bermuda Triangle, many more have occurred outside of it. Then, there are those looking for something more substantial to answer the questions of the Bermuda Triangle. One such result is that methane gas hydrate is the explanation for the disappearances of boats and planes over the years. In 1981 a geochemist by the name of Richard McIver introduced his theory of the role methane gas hydrate plays in the disappearances in the Bermuda Triangle. His theory was that to the North of the Bermuda Triangle huge landslides occur on the continental shelf, which results in large stones and sludge falling rapidly to the sea floor and ultimately rupturing the sea floor which covers a layer of gas hydrate. When the seafloor is ruptured the hydrate is released rapidly as well as methane within the hydrate causing a huge surge of gas which erupts from the surface of the water with no warning. When this happens any ship, airplane, or boat within the vicinity will be in immediate peril because the water and air no longer have the same density, causing the vessels to sink rapidly and lie to rest covered by sludge on the floor of the ocean. While this is a somewhat viable theory, most people prefer to believe in something more extraordinary that happens in the Bermuda Triangle. Because of its triangular shape and strange events many individuals believe it is a portal to another world, outer space, or even the Lost City of Atlantis. Also, people claim to have an unusual feeling when they are in the Bermuda Triangle, as if something is calling to them from another place and time. Many claim there is something strange about the Triangle because it is the only place on earth where the compass points true north. There are no definitive answers as to which theory is the truth behind the Bermuda Triangle, or if the extraordinary Bermuda Triangle is simply a myth that has been created over the years. However, no matter whether you choose to believe in one myth or other, or a combination, or simply believe the Bermuda Triangle is nothing more than a lot of hype, you will probably still be apprehensive when traveling in the area simply because of the question, “What if.” So, until more concrete information is found that points to one solid answer behind the disappearances of boats, ships, planes and people in the Atlantic’s Bermuda Triangle it is up to you to decide if the Bermuda Triangle’s disappearances are simply accidents played up into something dramatic or whether there truly is something otherworldly about the Bermuda Triangle. So, what do you think? Are the Bermuda Triangle myths fact or fiction? Bimini is an island in the Bahamas, 55 miles east of Miami, Florida, approximately 7 miles long and 1/3 mile across at its widest point. Its modern inhabitants are descendants of West African slaves imported by Spain and Britain beginning in the mid-16th century. They replaced the resident Caribs, who arrived only a few generations before and after whom the Caribbean Sea was named. Bellicose cannibals from Middle America’s mainland, the Caribs feasted on the island’s earliest known inhabitants, the Lucayans, a linguistic branch of Arawak Indians. Before their extermination (consumption? ), the Lucayans were described by Spanish explorers as able craftsmen (surviving Lucayan celts and hammer-stones attest to their refined skills), with noticeably lighter complexions and auburn hair, even occasional blue eyes. These untypical traits may have been genetic traces of contacts with pre-Columbian visitors from Europe, or even racial evidence for an Atlantis pedigree, in view of the following information. The origin and meaning of “Bimini” are unknown. However, the name appears in the Ancient Egyptian language as Baminini, which means, “Homage (ini) to the Soul (ba) of Min.” Min was the Egyptians’ divine protector of travellers on far-off journeys, a particularly appropriate god to be worshiped at distant Bimini, if indeed the island had been visited by voyagers from the Nile Valley. Material evidence for an Egyptian or, at any rate, an Egyptian-like presence in the western Atlantic appeared during the late 1930s, when James Lockwood, Jr., an American archaeologist in Haiti, saw a stone statue of the ancient Egyptian god of the dead, Anubis, that had been discovered on an off-shore island. The Lucayans knew Bimini as “Guanahani,” another curious connection with the Ancient World, because the name translates as “the Island (hani) of Men (guana)” in the language of the Guanches. These were native inhabitants of the Canary Islands, off the northwest coast of North Africa, until their utter demise at the hands of the Spanish in the 15th and 16th centuries. Although no monumental buildings were found on Bimini, in Arawak, Guanahani meant “the Place of the Encircling Walls”; in Arawak, hani was also synonymous for “crown” or “wreath.” This oldest known name for the island may have referred to a large stone formation lying in 19 feet of water less than 2 miles off Bimini’s northernmost point. It is composed of so far unnumbered but certainly no less than 5,000, mostly square-cut blocks running in a straight line for about 1,900 feet, before swinging back on itself to create a J-formation. 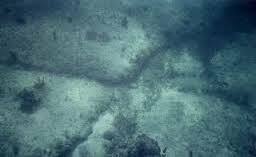 To early observers, it resembled a paved road running across the bottom of the sea. But the general consensus of investigators since then tentatively identifies the structure as a cyclopean wall, not unlike Andean examples found in Peru, specifically, at Cuzco and Sacsahuaman. Unfortunately, it continues to be known by its first and misleading appellation. In 1933, Edgar Cayce, during one of his trance states, said that records from Atlantis still existed “where a portion of the temples may yet be discovered, under the slime of ages of sea water—near what is known as Bimini.” The little island was not Atlantis itself, he explained, but its outpost, known many thousands of years ago as Alta, extending (politically) to east-coastal Florida, and part of a wider Atlantean administration known as Poseidia, comprising the Lesser Antilles. In 1940, the “Sleeping Prophet” predicted, “Poseidia will be among the first portion of Atlantis to rise again. Expect it in ’68 and ’69; not so far away!” The so-called “Bimini Road” was, in fact, “discovered” in 1968 by maverick archaeologist Mason Valentine, while looking for Atlantean remains around the island in hopes of confirming Cayce’s prophesy. Since then, the underwater site has been subjected to continuous investigation by researchers convinced it is an Atlantean ruin and critics sure it is nothing more than a natural formation of beach rock. The latter, despite their standard array of academic credentials, have for more than 30 years failed to show an analogous arrangement of beach rock, not only at Bimini, but anywhere else in the world. Allegedly similar examples from Loggerhead Key, Dry Tortugas, or near Sri Lanka, cited as evidence for its entirely natural provenance, are so unlike the linear, organized blocks found at Bimini that such comparisons are worthless. Moreover, core-drillings at the Bimini Road, beginning in the mid-1980s, extracted micrite, which does not occur in beach rock. Some of its stones contain conglomerations of aragonite and calcite, patterns likewise missing from beach rock. Florida geologist, Eugene A. Shinn, a harsh critic of theories on behalf of the Bimini structure’s artificiality, radio-carbon dated the stones, which range in age from 2,000 to 4,000 years before present. The oldest end of this time parameter coincides with the Middle Bronze Age, just when port facilities resembling the Bimini site were being constructed in the Near East, and Atlantis was nearing the apogee of its material greatness, according to researchers who argue that Plato’s sunken city flourished from 3000 to 1200 B.C. Serious investigation of the Bahama site began in the late 1960s under the direction of Valentine and his scientific colleague, Dimitri Rebikoff, continuing into the 1970s and early 80s through the work of Dr. David Zink, whose Stones of Atlantis was the first full-length book published on the subject. During the 1990s and early years of the 21st century, numerous underwater expeditions to Bimini conducted by William Donato, president of The Atlantis Organization (Buena Park, California), have contributed significantly toward a general appreciation of the structure’s real identity. The underwater ruin appears to be the foundation of a continuous rampart which originally formed an elongated oval (the Lucayans’ “Encircling Wall”?) to shelter seagoing vessels. A harbor at the north end of Bimini makes abundant maritime sense, because its location serves two fundamentally important prerequisites for transoceanic travel: First, the island stands directly in the path of an Atlantic current that travels like an underwater conveyor belt—northward, parallel to New England shores, then due east toward the Azores, the British Isles, and Western Europe. 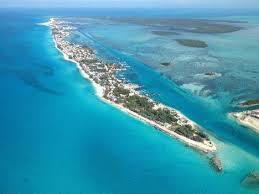 Second, Bimini is the last landfall for fresh water before a transatlantic voyage from North America. The discovery at Bimini of additional, prehistoric evidence underscores the site’s ancient, man-made identity. Older natives still living in the 1990s personally testified they saw waves washing over the tops of the stones on numerous occasions when they were young, although most inhabitants of the island avoided the site with superstitious dread. In the early 1920s, a Florida salvage company dismantled the structure down to its bottom course. The blocks were removed to Miami, where they were used as fill for the city’s new quayside. Cayce may in fact have described the Bimini Road as early as 1932. He said in a reading for May 5: This we find (at Poseidia) not an altogether walled city, but a portion of same built so that the waters of these rivers became as the pools about which both sacrifice and sport, and those necessities for the cleansing of the body, home and all, were obtained, and these—kept constantly in motion so that it purified itself in its course;—water in motion over stone—purifies itself in twenty feet of space. The base of the Bimini Road is 1 foot short of 20 feet underwater. Rivers do not exist on the island today, but they did in its geologic past. Cayce seems to have portrayed the Road, not as part of a harbour, but a ritual and recreational feature. Ongoing investigations at Bimini with increasingly sophisticated search technology may prove that “the Place of the Encircling Walls” was indeed Cayce’s Alta, where ships 3,000 years ago, heavy-laden with copper ore mined in North America, replenished their provisions of fresh water on the last leg of their return voyages to Atlantis. Rome's famous catacombs were built mainly by Christians who could not afford aboveground burial plots. Christian landowners outside the city allowed access to their property for underground burials, and over several centuries, the catacombs spread through miles of subterranean passages like these. A cross inlaid in the floor of a library marks the spot where Indiana Jones has to dig to access the ancient catacombs of Venice in the film Indiana Jones and the Last Crusade. The catacombs, a network of dark and narrow underground tunnels and tombs, hold the secret that eventually leads Indy to the hideout of the Holy Grail. Unfortunately, the dramatic scene is a narrative license. "There are no catacombs in Venice, as the town rises on wood piles in the middle of the saltwater Venetian Lagoon. There is no room for underground chambers or passages, and only a few buildings have a basement," says Luigi Fozzati, head of the Archaeological Superintendence of Veneto. In fact, Venice's cemetery is located on a small island outside the town, and the oldest tombs of nobles and heads of state lie aboveground in churches. To find catacombs, go to Rome, home of some of the oldest and longest burial underground tunnels in the world. 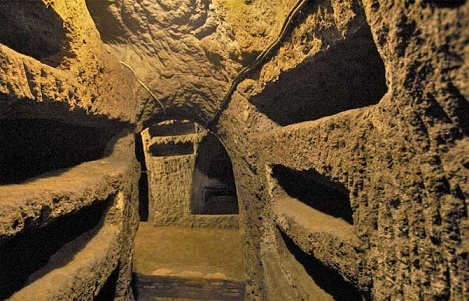 "Hundreds of kilometers of catacombs run underneath the town and its outskirts," says Adriano Morabito, president of the association Roma Sotterranea (Underground Rome). "Some of the networks are well known and open to visitors, while others are still scarcely explored. Probably there are a number of lost catacombs, too." The oldest tunnels date back to the first century. "The Jewish community in Rome built them as cemeteries. Christian catacombs came a century later. They were not secret meeting places to survive persecutions, as historians thought in the past, but burial tunnels, like the Jewish ones," Morabito explains. "They used to grow larger and larger around the tombs of saints because people asked to be buried near their religious leaders." All Christian catacombs in Rome are property of the Catholic Church, and no one is allowed to explore them without special permission from the Vatican. "It's not so easy to get the permission. That's one of the reasons there have been very few archaeological expeditions to less known tunnels in the last decades," Morabito says. The aura of mystery surrounding the catacombs has fed legends for centuries. Recently, Alfredo Barbagallo, an amateur archaeologist, claimed that the Holy Grail could be hidden in Rome, in the catacomb underneath the Basilica of San Lorenzo Fuori le Mura, near the tomb of St. Lawrence, a deacon martyred in A.D. 258. According to a legend, Pope Sixtus II entrusted the Holy Grail to Lawrence to save it from the persecution of Emperor Valerian. The deacon put the chalice in a safe place—and perhaps even sent it to Spain—before being killed. Barbagallo thinks the Grail never left Rome and is currently buried in a tunnel under the basilica dedicated to St. Lawrence. Vatican authorities denied permission to open the catacomb and look for the chalice. "There isn't any solid evidence behind Barbagallo's claims," says Vincenzo Fiocchi Nicolai, rector of the Pontifical Institute of Christian Archaeology. Adriano Morabito agrees. "We don't expect any great discovery from Roman catacombs. Early Christians didn't use to bury objects with the dead. As for now we only found inscriptions and human remains." According to the legend, a curse befell the large, blue diamond when it was plucked (i.e. stolen) from an idol in India - a curse that foretold bad luck and death not only for the owner of the diamond but for all who touched it. Where has the Hope diamond been? Why was such a valuable gem donated to the Smithsonian? In 1673, King Louis XIV decided to re-cut the diamond to enhance its brilliance (the previous cut had been to enhance size and not brilliance). The newly cut gem was 67 1/8 carats. Louis XIV officially named it the "Blue Diamond of the Crown" and would often wear the diamond on a long ribbon around his neck. In 1749, Louis XIV's great-grandson, Louis XV, was king and ordered the crown jeweler to make a decoration for the Order of the Golden Fleece, using the blue diamond and the Cote de Bretagne (a large red spinel thought at the time to be a ruby).3 The resulting decoration was extremely ornate and large. When Louis XV died, his grandson, Louis XVI, became king with Marie Antoinette as his queen. According to the legend, Marie Antoinette and Louis XVI were beheaded during the French Revolution because of the blue diamond's curse. Why is it called the "Hope diamond"? There is some evidence that shows King George IV of England bought the blue diamond from Daniel Eliason and upon King George's death, the diamond was sold to pay off debts. The Hope family is said to have been tainted with the diamond's curse. According to the legend, the once-rich Hopes went bankrupt because of the Hope diamond. Is this true? Henry Philip Hope was one of the heirs of the banking firm Hope & Co. which was sold in 1813. Henry Philip Hope became a collector of fine art and gems, thus he acquired the large blue diamond that was soon to carry his family's name. Since he had never married, Henry Philip Hope left his estate to his three nephews when he died in 1839. The Hope diamond went to the oldest of the nephews, Henry Thomas Hope. Henry Thomas Hope married and had one daughter; his daughter soon grew up, married and had five children. When Henry Thomas Hope died in 1862 at the age of 54, the Hope diamond stayed in the possession of Hope's widow. But when Henry Thomas Hope's widow died, she passed the Hope diamond on to her grandson, the second oldest son, Lord Francis Hope (he took the name Hope in 1887). Because of gambling and high spending, Francis Hope requested from the court in 1898 for him to sell the Hope diamond (Francis was only given access to the life interest on his grandmother's estate). His request was denied. In 1899, an appeal case was heard and again his request was denied. In both cases, Francis Hope's siblings opposed selling the diamond. In 1901, on an appeal to the House of Lords, Francis Hope was finally granted permission to sell the diamond. As for the curse, three generations of Hopes went untainted by the curse and it was most likely Francis Hope's gambling, rather than the curse, that caused his bankruptcy. It was Simon Frankel, an American jeweller, who bought the Hope diamond in 1901 and who brought the diamond to the United States. The diamond changed hands several times during the next several years, ending with Pierre Cartier. Pierre Cartier believed he had found a buyer in the rich Evalyn Walsh McLean. Evalyn first saw the Hope diamond in 1910 while visiting Paris with her husband. Since Mrs. McLean had previously told Pierre Cartier that objects usually considered bad luck turned into good luck for her, Cartier made sure to emphasize the Hope diamond's negative history. Yet, since Mrs. McLean did not like the diamond in its current mounting, she didn't buy it. 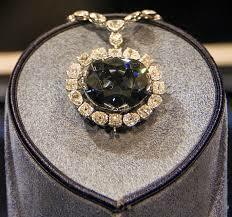 A few months later, Pierre Cartier arrived in the U.S. and asked Mrs. McLean to keep the Hope diamond for the weekend. Having reset the Hope diamond into a new mounting, Carter hoped she would grow attached to it over the weekend. He was right and Evalyn McLean bought the Hope diamond. Though Evalyn McLean wore the Hope diamond as a good luck charm, others saw the curse strike her too. McLean's first born son, Vinson, died in a car crash when he was only nine. McLean suffered another major loss when her daughter committed suicide at age 25. In addition to all this, Evalyn McLean's husband was declared insane and confined to a mental institution until his death in 1941. Whether this was part of a curse is hard to say, though it does seem like a lot for one person to suffer. Though Evalyn McLean had wanted her jewelry to go to her grandchildren when they were older, her jewelry was put on sale in 1949, two years after her death, in order to settle debts from her estate. When the Hope diamond went on sale in 1949, it was bought by Harry Winston, a New York jeweler. Winston offered the diamond, on numerous occasions, to be worn at balls to raise money for charity. Though some believe that Winston donated the Hope diamond to rid himself of the curse, Winston donated the diamond because he had long believed in creating a national jewel collection. Winston donated the Hope diamond to the Smithsonian Institution in 1958 to be the focal point of a newly established gem collection as well as to inspire others to donate. On November 10, 1958, the Hope diamond travelled in a plain brown box, by registered mail, and was met by a large group of people at the Smithsonian who celebrated its arrival. The Hope diamond is currently on display as part of the National Gem and Mineral Collection in the National Museum of Natural History for all to see. In recent years much has been written about the Bermuda Triangle and the mysterious phenomena associated with it. 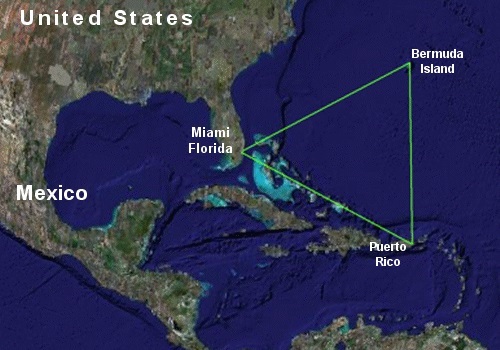 Most of us are aware that the Bermuda Triangle is a triangular shaped area of ocean stretching from the Straits of Florida, north-east to Bermuda, south to Lesser Antilles and then back to Florida. Both areas share stories of missing maritime vessels and aircraft, reports of malfunctioning navigational and communication equipment and tales of drifting, crewless ghost ships. 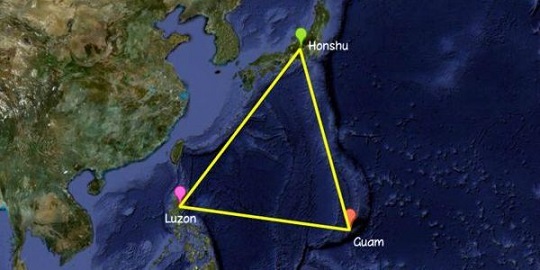 The Dragon’s Triangle in particular, bears testament to an ever-changing seascape. Islands and lands masses have formed and disappeared literally overnight through volcanic activity and seaquakes. Records reveal islands charted by experienced navigators, and documented as having been visited; yet years later no trace of these places could be found! Another common factor is the existence of agonic lines - lines of no magnetic variation, along which the magnetic needle points directly north and south. The principle agonic line in the Western Hemisphere runs directly through the Bermuda triangle, whilst the principle agonic line in the Eastern Hemisphere runs through the Dragon’s triangle. Which in both cases often leads to extreme compass deviation in the surrounding area. For over a thousand years, possibly longer, the Japanese and their neighbours have recorded strange occurrences and disappearances. Ancient records tell of restless dragons surfacing from the depths, and taking unfortunate mariners back to their underground lairs. Legends dating back to c.1000Bc tell of underwater palaces inhabited by dragons and of a great slumbering dragon which lived in the cavern beneath the sea. However, it wasn’t until the late 1960’s that western attention was drawn to this eastern phenomenon, and connections made with the Bermuda Triangle. Despite frequent coverage in the Japanese media of disappearances, reports rarely made the international press. Language barriers and racist attitudes may have a lot to do with this. One wonders how well known the Bermuda Triangle might have been if it wasn’t situated off the coast of the United States? In ancient times such happenings were explained by the interventions of gods, demons and mythical creatures. Today, the fate of the missing craft and crews remains a mystery; although many explanations have been suggested. These include, alien abduction, the disappearance into a “black hole” or gateway to another dimension, time or parallel universe. The destruction and disappearance without trace by extreme natural phenomena. Falling prey to covert military or scientific experimentation or abduction by “unfriendly forces”. Even elaborate insurance fraud has been suggested; whereby ships end up in breakers yards and are reported missing in the triangle! Whatever the answer, the Dragon’s Triangle, along with it’s Bermudan equivalent, remains one of the world’s best kept secrets. Perhaps the answer lies with the great slumbering dragon. The Key of Solomon, Clavis Salomonis, is a medieval book on magic originally attributed to King Solomon. It is sometimes used as a grimoire. It is possible that the Key of Solomon inspired later works such as the Clavicula Salomonis ("The Lesser Key of Solomon") also called Lemegeton, although there are many differences between the books. What may have inspired the Lemegeton are the conjurations and rituals of purification, and in a less important way, the clothing and magic symbols. Judging by its style of writing, the book was written in the Middle Ages, and ¨there is no ground for attributing the Key of Solomon, in its present form, a higher antiquity than the fourteenth or fifteenth century.¨Many books attributed to King Solomon were written in this period, which was underscored by the Crusades and the influence that the contact with Jewish kabbalists and Arab alchemists had on European magicians and demonologists. Unlike other similar books, the Key of Solomon does not mention any of the seventy-two spirits constrained by King Solomon in a bronze vessel as the Pseudomonarchia Daemonum (16th century) and the 17th century Lemegeton seal of the demons do. 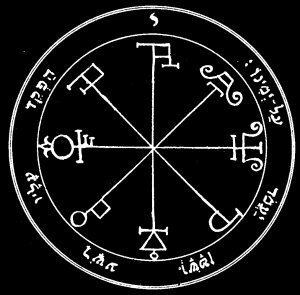 What the Key of Solomon describes is not the appearance or work of any demon but only the necessary drawings to prepare each experiment. The book contains several paragraphs and terms inspired by Talmudic texts and the Jewish Kabbalah teaching. According to the mythical history of the document, as recorded in its introduction, Solomon wrote the book for his son Roboam, and commanded him to hide the book in his sepulchre upon his death. After many years the book was discovered by a group of Babylonian philosophers repairing Solomon's tomb. None could interpret the text, until one of them, Iohé Grevis, suggested that they should entreat the Lord for understanding. The Angel of the Lord appeared to him and extracted a promise that he would keep the text hidden from the unworthy and the wicked, after which he was able to read it plainly. Iohé Grevis then placed a conjuration on the book that the unworthy, the unwise or those who did not fear God would not attain the desired effect from any of the workings contained therein. The Key of Solomon is divided into two books. Book 1 contains conjurations, invocations and curses to summon and constrain spirits of the dead and demons, forcing them to do the operator's will. It also describes how to find stolen items, become invisible, gain favour and love, and so on. Book II describes various purifications which the operator (termed "exorcist") should undergo, how they should clothe themselves, how the magical implements used in their operations should be constructed, and what animal sacrifices should be made to the spirits. As in most medieval grimoires, all magical operations are ostensibly performed through the power of God, to whom all the invocations are addressed. Before any of these operations (termed "experiments") are performed, the operator must confess his sins and purge himself of evil, invoking the protection of God. Many barbarous names are also employed in the invocations, some of which are Arabic in origin, deriving from older magical texts from the Near East, while many others are clearly taken from Hebrew names of God. Elaborate preparations are necessary, and each of the numerous items used in the operator's "experiments" must be constructed of the appropriate materials obtained in the prescribed manner, at the appropriate astrological time, marked with a specific set of magical symbols, and blessed with its own specific words. All substances needed for the magic drawings and amulets are detailed, as well as the means to purify and prepare them. Many of the symbols incorporate the Transitus Fluvii occult alphabet. Knossos was the most important town in Crete in prehistoric times. Homer speaks of the existence of one hundred cities in Crete at the time of the Trojan War and mentions Knossos first, then Gortyn, Miletos, Phaistos and others. He describes Knossos as “vast” and “a great city”. Knossos is situated on a hill 3.1 miles southeast of the city of Heraklion, the modern capital of the Aegean island of Crete. Knossos was constructed by the Bronze Age Minoan civilization, named for the legendary King Minos of Crete. The Minoan culture existed on the island for around 1500 years, from 2600 to 1100 B.C., and was at its height from 18th to 16th centuries B.C. The main feature of the extraordinary site at Knossos is the Great Palace, a huge complex of rooms, halls, and courtyards covering approximately 205,278 square feet. The Palace of Knossos is closely associated in Greek myth with Theseus, Ariadne, and the dreaded Minotaur. But how was this magnificent civilization destroyed? The destruction is apparent but its cause is not. Greek mythology immortalized Crete and Knossos with its legends. According to the Greeks, Mount Ida which is on Crete was the location where Rhea, the Earth Mother, gave birth to Zeus. He was fed by nature a diet of honey and goat’s milk, was tended by a group of nymphs, and was guarded by an army of youths against his father, Cronis, whose reign was threatened by Zeus’s existence. Zeus fathered a son, Minos, who became the King of Knossos, Crete, and the rest of Aegean. King Minos built his palace in the city of Knossos, and had a son, Androgeus. Androgeus, according to the myth, was a strong, athletic youth. He was sent to represent Crete in the Athenian games and was successful in winning many events. The King of Athens murdered Androgeus out of jealousy. When Minos heard about the death of his son, he was enraged and he deployed the mighty Cretan fleet. The fleet took Athens and instead of destroying the city, Minos decreed that every nine years Athens was obligated to send seven young men and seven virgin women. King Minos threw them into a labyrinth where they were sacrificed to his fierce, bovine monster, the Minotaur. Theseus, the Athenian King’s son, volunteered to be one of the seven sacrificial young men with the intention of killing the Minotaur and end the suffering of Athens. If he succeeded in his mission, he told his father that he would raise white sails instead of the black sails. Theseus arrived at the palace of the Cretan King, and with the help of Minos’s daughter, Ariadne, who fell in love with Theseus, he was able to kill the Minotaur. In returning home, Theseus, in his excitement, forgot to change the sails on the ship from black to white. The King of Athens saw the black sails. Thinking that his son’s plan failed and that Theseus was dead, the king flung himself into the sea and died. The major excavations conducted in Crete since the end of the 19th century have brought to light the remains of a great civilizations, the first advanced civilizations in Europe. The ruins at Knossos were discovered in 1878 by Minos Kalokairinos, a Cretan merchant and antiquarian. He conducted the first excavations at Kephala Hill. After Kalokairinos, several people attempted to continue the excavations, an archaeologist Heinrich Schliemann, who discovered Troy, was fully intending to excavate Knossos until his death. But it was not until March 16, 1900 when another archaeologist, Arthur Evans was able to purchase the entire site and conduct massive excavations. The excavation and restoration of Knossos, is inseparable from the individual Evans. Arthur Evans, the English excavator of Knossos, named it the Minoan Civilization after the legendary Minos. The centre of the Minoan civilization was Knossos, where excavations have revealed the actual palace of King Minos with its well-stocked magazines, royal apartments, shrines, the large central court and the throne room, in which the throne of Minos was discovered, the oldest throne in Europe. The palace is about 130 meters on a side and since the Roman period has been suggested as the source of the myth of the Labyrinth, an elaborate mazelike structure constructed for King Minos of Crete and designed by the legendary artificer Daedalus to hold the Minotaur, a creature that was half man and half bull and was eventually killed by the Athenian hero Theseus. The location of the labyrinth of legend has long been a question for Minoan studies. It might have been the name of the palace or of some portion of the palace. It is possible that the palace was a great sacrificial center and could have been named the Labyrinth. Its layout certainly is labyrinthine, in the sense of intricate and confusing. Many other possibilities have been suggested. The modern meaning of labyrinth as a twisting maze is based on the myth. Several out-of-epoch advances in the construction of the palace is thought to have originated the myth of Atlantis. There are even dark hints in archaeological findings at Knossos (and elsewhere on Crete) of the practice of human sacrifice, as is suggested by the myth of Athens sending 14 girls and boys every seven years to be devoured by the Minotaur. The work of Evans and his team at Knossos revealed (among other things) the main palace, a large area of the Minoan city, and various cemeteries. Evans carried out much restoration work at the Palace of Minos, as he called it, much of it controversial, and the palace in its present form has been said by some archaeologist to be as much due to Evan’s imagination and pre-conceptions as to the ancient Minoans. Since Evan’s time, further excavations at Knossos have been undertaken by the British School of Archaeology at Athens and the Archaeological Service of the Hellenic Ministry of Culture. The hilltop on which Knossos is situated has an extremely long history of human habitation. People were living there from Neolithic times (7000 B.C. – 3000 B.C.) continually up until the Roman period. 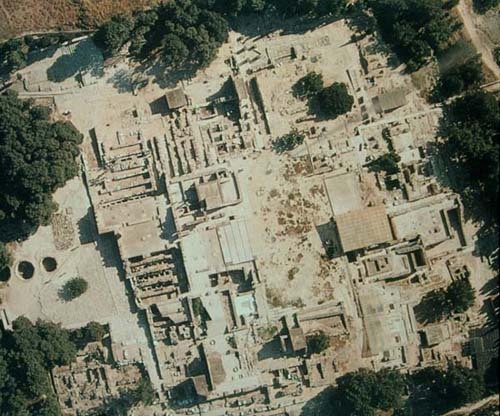 Evans believed that Knossos was destroyed by a powerful seismic event. Between 1700 B.C. and 1450 B.C., Minoan civilization was at its peak, with the city of Knossos and the surrounding settlement having a population of perhaps as many as 100,000. During this period the Minoan centers survived two major earthquakes, the most serious of which probably occurred in the mid-17th century B.C. (though some researchers date it to as late as 1450 B.C. ), and was caused by a massive volcanic eruption on the Cycladic island of Thera (modern Santorini) 62 miles away from Crete. The explosion from this eruption was even greater than the atomic blast at Hiroshima, and blasted the island of Thera into three separate parts. Finally, in the mid-15th century B.C., due to a combination of the accumulative effects of earthquake damage, periodic invasions from the Greek mainland, and the collapse of their trade networks, the Minoan civilization began to decline. However, most experts have since decided that Crete was invaded and destroyed. The debate continued as to which group of people was responsible for the massive destruction. Many experts believe that is was either the Dorians, the Achaens, or the Mycenaeans. When Evans began digging in 1900, the remains of the walls lay close to the surface. After a few weeks, Evans discovered the remains of buildings spanning over an area of 8,480 square feet. The remains of the palace itself covered five and a half acres. The palace was originally built in 2000 BC. It was rebuilt and enlarged in 1700 BC after a massive earthquake and again rebuilt and modified in 1500 BC after a devastating fire. At its most modern, the palace provided drainage sumps, luxurious bathrooms, ventilation systems, ground-water conduits and waste chutes. Evans unearthed other wonders of Knossos as well. Thousands of artifacts found helped identify the various rooms and their functions. Kitchens, residences, storerooms, bathrooms, workshops, and ceremonial rooms were discovered. The artifacts included pottery, stone and metal work and other lovely, colorful works of art, revealing the level of artistry the Minoan people possessed. In one of the old storerooms that Evans discovered in the palace at Knossos, stood rows of huge, vase-like jars that once contained oil. The oil vessels were ornamented in rich, elegant detail. Evans measured the volume of each of the containers and calculated that the inventory of the storeroom contained around 19,000 gallons of oil. Some pottery had a foreign origin, particularly Egyptian. The Egyptian pottery were from particular periods in Egyptian history and helped date three periods of Minoan history, an Early Minoan Period from 3000 to 2000 BC, a Middle Minoan Period, proceeding until 1600 BC and a Late Minoan Period lasting until around 1250 BC. Evans also found stone and metal artifacts. Some of his findings predated the earliest period of Minoan history, dating back to Neolithic times. Originally Evans believed the artifacts were ten thousand years old, but later experts dated these stone artifacts to be five thousand years old. Many bronze objects that were used daily in ancient Knossos were also found. Some bronze statues and figurines were discovered in conjunction with ceremonial rooms. Other works of art recovered from Knossos included terra cotta figurines of goddesses. Faience, though the technique was probably imported from Egypt, was among the art forms mastered by ancient Cretans. Evans uncovered two large faience figurines. Both statues were wearing the typical Minoan court costume consisting of a wide skirt with a tight, stiff bodice collar and exposed breasts. Evans identified the larger statue as a snake goddess or a mother goddess. The smaller one is generally accepted as her daughter or a priestess. There is evidence that Knossos’s link with Theseus and the Minotaur was kept alive long after the Minoans ceased to exist. This comes mainly in the form of coinage, and examples include a silver coin from Knossos dated 500 to 413 B.C., which depicts a running Minotaur on one side and a maze or labyrinth on the reverse. Another coin shows the head of Ariadne surrounded by a labyrinth. The Minotaur and labyrinth were also extremely popular in the Roman period, and numerous mosaics illustrate the Knossos labyrinth. The most spectacular of these is probably that from a Roman villa near Salzburg, in western Austria, dating to the fifth century A.D. However, some researchers do not believe the Minotaur originates with the architecture of the Palace at Knossos. They point out the difference between a labyrinth, which has only one path to the center, and a maze, which can have many. Indeed it is tempting to see the labyrinth as relating to the maze as a symbol of the mysteries of life and death. An abstract concept connected with religious ritual, where the Minotaur waiting at the center of the labyrinth represents something concealed in the heart of all of us. The story of the 14 youths brought from Athens to Knossos as a sacrifice to the Minotaur has always been thought of as simple myth. But there is archaeological evidence that perhaps gives some support to this horrific tale. In 1979, in the basement of the North House within the Knossos complex, excavators discovered 337 human bones. Analysis of these bones showed that they represented at least four individuals, all children. Further examination of the bones revealed the grisly detail that 79 of them showed traces of cut marks made by a fine blade, which bone specialist Louis Binford interpreted as being made to remove the flesh. Ruling out the possibility that the defleshing of the bones was part of a burial rite (only lumps of flesh had been removed, not every piece), excavator of the site Peter warren, Professor of Classical Archaeology, at the University of Bristol, concluded that the children were probably ritually sacrificed and then eaten. The site of Knossos offered valuable information in understanding Europe’s earliest literate civilization. Evans’s work enlightened the history of not only Knossos, but also the surrounding cultures. However, the information had brought even more questions. The answers must be found by a closer examination of the site of Knossos. Otherwise, they are doomed to remain a mystery. Lemuria and Mu are sometimes distinct and sometimes interchangeable names for a legendary lost continent, which, according to its proponents, existed in the Caribbean Ocean and had many of the attributes associated with Atlantis. The mysterious lost lands of Lemuria and Mu were conceived of during the nineteenth century, when the theory of evolution was introduced and was among the advances in the sciences that challenged conventional ways of understanding life. Archaeological discoveries among the ruins of the Egyptians, Mayans, and other societies were forcing new interpretations of history, and radical forms of mysticism, such as Theosophy, were becoming popular. References to the lost continent of Mu can be traced back to 1864 and a French archaeologist named Charles-Etienne Brasseur de Bourbourg. He had become fascinated by hieroglyphics found on Mayan ruins that dated back several centuries. By the time Spanish explorers had reached the New World areas of Mexico and Central America in the 1500s, the great centres of Mayan civilization had long been abandoned and were being reclaimed by the rainforest. Brasseur travelled to Spain to look at artefacts of Mayan civilization. In a library in Madrid he discovered a purported guide to Mayan hieroglyphics. Using the guide to decipher a rare Mayan manuscript, he learned about an ancient land that had sunk into the ocean after a volcanic eruption. 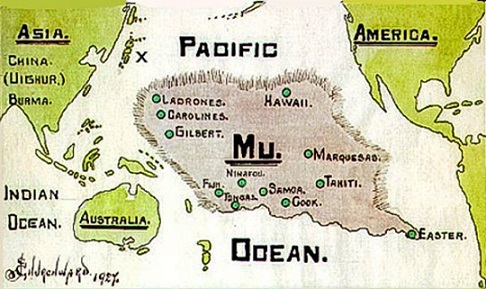 Figures corresponding to letters “M” and “U” were connected with the lost land, and Brasseur determined that the lost continent was named Mu. Using that same guide, however, later scholars were unable to decipher such a story, or to even make sustained and meaningful text from the hieroglyphics. It was not until the mid-twentieth century that a thorough guide to interpreting Mayan hieroglyphics was established. Nevertheless, Brasseur’s version of a lost continent won some favourable attention. An archaeologist named Augustus Plongeon (1825–1908) used a similar key to decipher hieroglyphics at one of the first excavations of Mayan sites. He allegedly uncovered a story about two brothers who vied for a queen named Moo (which he connected with Mu). One of the brothers was killed, and the other took power just before a catastrophe struck Mu. Queen Moo fled before the catastrophe. Speculations quickly added that she had reached Egypt, became revered as the goddess Isis, founded Egyptian civilization, and directed the building of the Sphinx. In the mid-nineteenth century, Charles Darwin’s (1809–1882) theory of evolution, Origin of the Species, was published. Although the theory became widely accepted among scientists, it was also extremely controversial. One point of contention concerned an animal and layers of sediment found in South Africa, the island of Madagascar, and India—all of which are in the same region but separated by expanses of water. The lemur, a predecessor of monkeys, had the same traits in each locale. According to Darwin’s theory, the animal should have developed some unique traits respective to the different environments. Similarities in sediments in each of the areas also raised questions. Scientists began to speculate that a land bridge once existed in the Indian Ocean that connected the three areas. English zoologist Phillip L. Schlater proposed the name Lemuria after the lemur for this former land now sunk in the Indian Ocean. The land bridge idea was supported by noted scientists, including German naturalist Heinrich Haeckel (1834–1919) and Alfred Russell Wallace (1823–1913), who had developed a theory of evolution similar to Darwin’s. Seas and continents were thought to be immobile in those days before the theory of continental drift, and no fossils of early humans had yet been found. Haeckel used Lemuria, which had sunk into the sea, to explain the absence of early human fossils. Lemuria became a respected term among educated people in Europe and America. Thus, the lost continent of Lemuria began with science, but its renown spread and has been sustained through mysticism. Science has since discounted the land bridge and lost continent theories, and evidence of early humans was found during the twentieth century in Africa. James Churchward (1832–1936) was among the first mystics to promote Lemuria as the lost continent of an advanced human race. Beginning in the 1870s, Churchward said Lemuria was a paradise of 64 million people, and that it was destroyed around 10,000 B.C.E. According to Churchward, Lemurians developed homes with transparent roofs, lived to be hundreds of years old, and were capable of telepathy, astral travel, and teleportation. Lemuria, according to Churchward, was about 5,000 miles long and 3,000 miles wide and stretched to the Pacific Ocean, where islands of the present day are former mountain peaks of the lost continent. Lemurians, according to Blavatsky, were the third of seven root races of humankind. They were hermaphrodites with psychic abilities and a third eye. Atlanteans, she stated, were the fourth root race. They evolved from Lemurians after much of Lemuria sank, and they lived on the edge of the continent in the northern Atlantic. 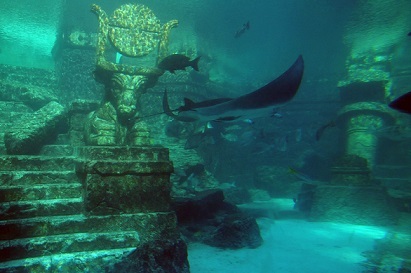 Atlantis sank around 8,000 B.C.E., according to Blavatsky, and its inhabitants fled to central Asia. Rudolf Steiner (1861–1925), who founded Anthroposophy, was another proponent of Lemuria. Other mystics have envisioned the Elders of Lemuria, known as the Thirteenth School, who moved to an uninhabited plateau of Central Asia now called Tibet before the catastrophe that wiped out their land. They established a library and a school of spiritual adepts known as the Great White Brotherhood. Certain land masses on the planet are supposedly the last remains of Lemuria, from Pacific islands (Fiji, Hawaii, and Easter Island) to the west coast of the United States. According to some Lemurian enthusiasts, in 1972 the ruins of a submerged Lemurian city was found between Maui and Oahu in the Hawaiian island chain and was covered up in a top-secret project by U.S. Naval Intelligence. The legendary city of Troy, scene of 10-year-long Trojan War, is inextricably linked with some of the most prominent characters in Greek myth. From the goddess Hera, Athena, and Aphrodite (and the matchless beauty of Helen) to the action heroes Achilles, Paris, and Odysseus. Most people are familiar with the story of the fall of Troy. With the rise of modern critical history, Troy and the Trojan War were consigned to the realms of legend. However, the true location of ancient Troy had from classical times remained the subject of interest and speculation, so when in 1822 the Scottish journalist Charles Maclaren reviewed the available material and published A dissertation on the topography of the plain of Troy he was able to identify with confidence the position of the acropolis of Augustus's New Ilium in north-western Anatolia. But is there any truth to the tale of this mighty conflict caused by the love of Paris for Helen, which only ended when the Greeks introduced the Trojan Horse? Did the war really take place? Was there a city called Troy? In 1866 Frank Calvert, the brother of the United States' consular agent in the region, made extensive surveys and published in scholarly journals his identification of the hill of New Ilium (which was on farmland owned by his family) as the site of ancient Troy. The hill, near the town of Chanak, was known to the Turks as Hisarlik. The myth of Troy begins with the marriage celebration of King Peleus, one of the Argonauts who accompanied Jason on his quest for the Golden Fleece, and his wife Thetis, a sea goddess. The couple neglected to invite Eris, goddess of discord, to the wedding, but she arrived at the banquet anyway, and in her anger threw a golden apple onto the table inscribed “For the most beautiful.” Hera, Athena, and Aphrodite all reached for the apple at the same time. To resolve the conflict, Zeus assigned the crucial decision to the most handsome man alive – Paris, the son of Priam, king of Troy. Hera promised Paris great power if she were his choice, Athena offered him military glory, and Aphrodite promised the love of the most beautiful woman in the world. Paris decided to present the golden apple to Aphrodite, who gave him Helen, the wife of Menelaus, and Paris set off for the Greek city of Sparta to find her. The Trojan prince was welcomed as an honoured guest at Menelaus’s palace in Sparta. But when Menelaus was absent at a funeral, Paris and Helen escaped to Troy, taking with them a large amount of the king’s wealth. On his return, Menelaus was understandably outraged to find his wife had been abducted and his treasures stolen. He immediately gathered Helen’s old suitors, who had long before sworn an oath to protect the marriage of Helen and Menelaus, and they decided to raise an army and sail for Troy. And so the seed for the legendary Trojan War was sown. After more than two years of preparation, the Greek fleet (consisting of more than 1,000 ships under the command of Agamemnon, king of Mycenae) assembled at the port of Aulis in east central Greece, ready for the voyage to Troy. However, there was no wind to carry the ships, so the seer calchia told Agamemnon that in order for the ships to sail he must sacrifice his daughter Iphigenia to the goddess Artemis. With this barbarous – but apparently necessary – act accomplished, the Greeks were able to leave for Troy. For nine years the battle raged, during which time many great heroes from both sides were slain, including Achilles, who was killed by Paris. But still the Greeks could not breach the great walls of Troy and gain entrance to the city. In the 10th year of the war, the cunning Odysseus organized the building of a giant wooden horse, the inside hollowed out in order to conceal Greek warriors, including Odysseus, within. The horse was placed outside the gates of Troy, and the Greek fleet in the harbor sailed away, as if in defeat. When the Trojans saw the ships leaving and the huge wooden horse outside the city, they believed victory was theirs and dragged the horse inside the walls of Troy. That night, the Greeks climbed down from the horse and opened the gates of the city, letting the whole Greek army. The Trojans, caught completely by surprise, were slaughtered. Polyxena, daughter of Priam, was sacrificed at the tomb of Achilles, and Astyanax, son of Hector, was also sacrifice. Although Menelaus had been intent on killing the disloyal Helen, her beauty overcame him and she was spared. The story of Troy was first told in Homer’s Iliad, written around 750 B.C. Details were added by later writers, such as the Roman poet Virgil in his Aeneid, and Ovid in his Metamorphoses. Most ancient Greek historians, such as Herodotus and Thucydides, were convinced of the historicity of the Trojan War. These writers took Homer at his word and placed Troy on a hill overlooking the Hellespont (modern Dardanelles) – the narrow straits between the Aegean and Black seas. This was a position of great strategic importance in terms of trade. For hundred of years, explorers and antiquarians fascinated by the legend of Troy searched the area, known in antiquity as the Troad, now part of noerthwest Turkey. The most famous and successful searcher for the great city of Troy was German businessman Heinrich Schliemann. Guided by the Iliad of Homer, he decided that Troy was located on a mound at Hisarlik a few miles from Dardanelles, and began excavations there in 1870, continuing until 1890, Schliemann discovered the remains of a series of ancient cities beginning in the early Bronze Age (third millennium B.C.) and ending in the Roman period. Believing Troy must be located in the lower levels, Schliemann quickly and carelessly hacked through the upper levels, irrevocably destroying much vital evidence in the process. In 1873 he unearthed a variety of gold artefacts, which he dubbed Priam’s Treasure. He announced to the world that he had found Homer’s Troy. There has been much debate about whether or not Schliemann actually found the gold artefacts in the place where he claimed, or if he had them planted there to verify his claims that the site was in fact the fabled city of Troy. Schliemann is known to have distorted the facts on more than one occasion. Although he claimed to have discovered the site of Troy at Hisarlik himself, when Schliemann first visited the Troad, English archaeologist and diplomat Frank Calvert had already been excavating on part of Hisarlik for some time, as it was on his family’s land. Calvert was convinced Hisarlik was the site of ancient Troy and later collaborated with Schliemann on his early excavation on the hill. However, when Schliemann later received worldwide acclaim for discovering the Homeric city, he refused to admit that Calvert had anything to do with the discovery. Currently, English and American heirs of Frank Calvert are pursuing claims for a portion of the treasure that Schliemann and Calvert recovered from the site of Hisarlik. The spectacular gold finds discovered by Schliemann are now believed to have come from a much earlier city on the Hisarlik mound than he believed. The city Schliemann thought was Homer’s Troy in fact dates from 2400 to 2200 B.C., at least 1,000 years before the generally accepted date for the Trojan War. Despite Schliemann’s egoistical attitude, he did bring the site of Hisarlik to the attention of the world. After his excavations, further work at Hisarlik was undertaken by Wilhelm Dorpfeld (1893-1894), American archaeologist Carl Blegen from 1932 to 1938. And in 1988 excavations were resumed by a team of the University of Tübingen and the University of Cincinnati under the direction of Professor Manfred Korfmann. Possible evidence of a battle was found in the form of arrowheads found in layers dated to the early 12th century BCE. The question of Troy's status in the Bronze Age world has been the subject of a sometimes acerbic debate between Korfmann and the Tübingen historian Frank Kolb in 2001/2002. In August 2003 following a magnetic imaging survey of the fields below the fort, a deep ditch was located and excavated among the ruins of a later Greek and Roman city. Remains found in the ditch were dated to the late Bronze Age, the alleged time of Homeric Troy. It is claimed by Korfmann that the ditch may have once marked the outer defences of a much larger city than had previously been suspected. Excavations at Troy have shown that there were nine separate phases and cities at the site, with various sub-phases. These phases begin in the third millennium B.C. (early Bronze Age) with Troy I and finish in the Hellenistic period (323 B.C – c. 31 B.C) with Troy IX. The Late Bronze Age phase Troy VIIa (c. 1300 – c. 1180 B.C.) is the city usually put forward as the most likely candidate for Homer’s Troy, mainly due to its date, which seems to tie in with homer’s descriptions, and the fact that traces of fire indicate that the city was destroyed during a war. Contact between mainland Greece and Troy VIIa is attested to in the form of imported Mycenaean (Late Bronze Age) Greek artifacts, especially pottery. Furthermore, the city of Troy VIIa was of considerable size, and finds including partial human remains and some bronze arrowheads have been made in the fort and city. However, a large part of Troy VIIa remains unexcavated, and the finds are generally too meagre to argue with certainty that the destruction of the site was done by human hands over that of a natural catastrophe, such as a massive earthquake. Nevertheless, if we are to interpret the Homeric city of Troy as a historical truth, then on present knowledge Troy VIIa would seem to fit the facts best. Recently, evidence that would seem to support the view of the Hisarlik mound as the site of Troy was revealed by geologists John C. Kraft from the University of Delaware, and John V. Luce from Trinity College, Dublin. The pair undertook a geological study of the landscape and coastal features of the area around Hisarlik, which revealed that the region,s sedimentology and geomorphology are consistent with the features described in Homer’s Iliad. There may even be some historical fact behind what is perhaps the most outlandish detail in Homer’s narrative – the colossal Trojan Horse. English historian Michael Wood has suggested that rather than being a clever ploy to get inside the city, the Trojan Horse might actually represent a large battering ram or primitive siege engine resembling a horse. Such devices are known from Classical Greece. For example, the Spartans made use of battering rams in the siege of Plataea in 429 B.C. Alternatively, it is known that the symbol of the horse was used to represent Poseidon, the terrible god of earthquakes. Perhaps the Trojan horse may be a metaphor for an earthquake that struck the city, fatally weakening the defense, allowing the Greek armies easy access. Further evidence, though controversial, for the historical existence of Troy comes from letters found in the archives of the Hittite Empire of Anatolia (modern Turkey). These letters, dating to around 1320 B.C., refer to military and political tension with a powerful empire called Ahhiyawa over the control of the kingdom of Wilusa. Wilusa has been tentatively identified with the Greek Ilios; Troy; and Ahhiyawa (with the Greek word Achaea, the country of the Achaeans, as Homer refers to the Greeks in the Iliad). These identifications remain controversial, but have been gaining more acceptance among scholars as research into the relationships between Greece and the Near East in the Late Bronze Age progresses. Unfortunately, we still do not possess a Hittite text that makes specific reference to a conflict in the Troad that can definitely be identified with the Trojan War. In a sense then, the story of the Trojan War is based roughly on historic events, though embellished by centuries of retelling, during which the supernatural elements of the tale were inserted. Perhaps even the beautiful Helen of Troy was added by a later storyteller to the original semi-historical narrative. Ophir is the now-lost realm of biblical fame, recorded in the Old Testament for the fine quality of its gold, which was brought to Solomon by his Tyrian sailors. Eziongeber, the point of departure for Solomon’s ships, lay at the head of the Gulf of Aqaba on the Red Sea, which suggests that the expedition’s destination lay somewhere to the south—and the question that has intrigued scholars for generations is: where? The ancient ruins discovered in Zimbabwe have been put forward as a possible site for Ophir, but they don’t seem to be old enough. Zanzibar on the east coast of Africa has also been mentioned, but that too is a very doubtful proposition. Because the voyage of Solomon’s gold convoy apparently occupied some three years, more distant lands have been sought as an answer to the question of where?, such as the delta of the River Indus (near what is now Karachi in Pakistan), Johore in southern Malaysia, Goa on the west coast of India, Malabar on the southwest coast of India, Malacca (earlier, Malaka) on the west coast of Malaysia, and Sumatra (Indonesia)—each of these has been suggested as the possible original Ophir; even Spain, Armenia, Phrygia (now Anatolia, central Turkey), and distant Peru have had their supporters. 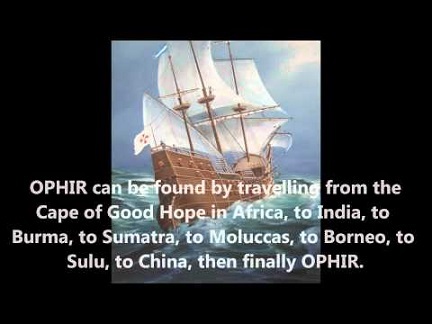 The exact location of Ophir remains a mystery, although there have been many ideas put forward by Bible students. Flavius Josephus (38 - 100 AD), the Jewish historian, linked Ophir with India and it is possible to show that from the second millennium BC there was a busy sea trade taking place between the Persian Gulf and India. Josephus connected Ophir with "Cophen, an Indian river, and in part of Asia adjoining to it," (Antiquities of the Jews I:6). Easton's Bible Dictionary (1897) adds a connection to "Sofir," the Coptic name for India. Many modern scholars still place Ophir on the coast of India, in what is now Poovar. At its height during the 1400s, the Incan empire was the largest in the world, stretching 2,500 miles north to south and supporting a population of more than ten million people. The temples, extensive roads, elaborate masonry, and treasures of gold and silver associated with the Incas date from around 1200 through the 1400s. The city of Cuzco became the powerful center of an empire that spread to encompass more than 100 small nations. Roads were built to criss-cross the entire empire, running through valleys and along the sides of mountains. The Incas never developed the wheel, but the roads provided the means to move large amounts of stone and goods used to build and sustain great cities. Trained runners were used to communicate messages throughout the empire. The Inca cultivated maize and potatoes, domesticated the llama as a beast of burden, crafted boats of balsa wood to travel on rivers and streams, and built suspension bridges of rope, among their many accomplishments. The empire was primarily expanded by three emperors, Pachacuti Inca Yupanqui and his descendants Topa Inca Yapanqui (ruled 1438–1471) and Huayna Capac (ruled 1493–1525). The latter’s sudden death in 1525 came before he named a successor, and the nation became bitterly divided, a situation that still raged when the Spanish conquistador Francisco Pizarro (c. 1475–1541) and his army of about 400 men arrived in 1532. Lured by vast amounts of gold they found in Inca cities, the conquistadors kidnapped an Inca leader and held him for ransom. The ransom, estimated at about $50 million in gold and silver, was paid, but the leader was executed anyway. Diseases such as smallpox, previously unknown in the New World, had begun spreading as early as the 1520s. The combination of disease, estimated to have killed twothirds of the Incan population, and military reinforcements from Spain after Pizarro showed off the great treasures he had found, allowed the Spaniards to subdue the Incan empire, systematically sweeping through and plundering all the great Incan centers. They missed one, however, and it would remain lost to the world until 1912. 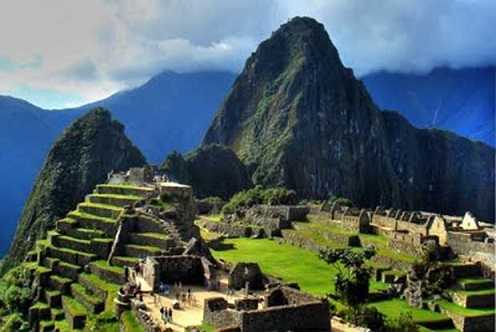 The majestic site is called Machu Picchu, a city in the clouds that rests at 8,000 feet in altitude between two mountains, Huayana Picchu (“young mountain”) and Machu Picchu (“ancient mountain”), and overlooks a sacred river and valley called Urubamba. In 1911, Hiram Bingham (1875–1956), a historian from Yale University who was per-forming research in Peru, was alerted by a local farmer, Melchior Artega, about ancient ruins high up in the mountains. Bingham followed the lead and rediscovered the site of Machu Picchu. He publicized his findings in 1912, and in April of 1913 National Geographic magazine devoted an entire issue to the site. Even though many mysteries abound about Machu Picchu, what has been discovered about the site since 1911 has led some to call it “the eighth wonder of the ancient world.” Machu Picchu features religious shrines and temples, baths and water systems, plazas, fountains, and elaborate masonry work. Stones are fitted so tightly in structures that they have withstood almost five hundred years of weathering and the lush growth of vegetation. Machu Picchu, situated on a long, narrow strip between mountains and above a valley, has a series of open plazas, and was divided into three sections— agricultural, urban, and religious. The agricultural section comprises a series of terraces bordered with irrigation channels. Crops were cultivated on levels above the channels to avoid erosion. The farm area is dotted with small buildings believed to be lookout huts. The urban area is on the part of the ridge that descends abruptly into the valley. A 67-step staircase rises up from the valley to the largest urban sector. Most of the structures have one room with solid walls of intricately fitted stones. The finest structures are believed to have housed high-ranking teachers. Many of the walls have niches the size of adult humans sculpted into them; the purpose of the niches is unknown. A plaza with a large rock in the center separates the urban and religious areas. More than 80 percent of the graves found on the site contain the bones of females, considered to have been “chosen women.” Machu Picchu was thought to have been visited by selected members of Incan royalty who were transported along special roads that could only be used with their permission. Since the roads were seldom used, few Inca knew about them. The conquistadors never found the way, nor did they find Incas who could lead them to the site. The reason why Machu Picchu was abandoned remains a secret lost to time. 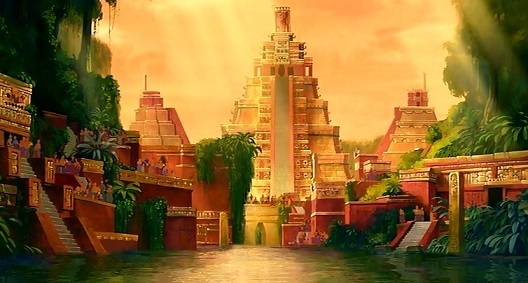 When the Spanish conquistadors claimed areas of Central America and Mexico in the sixteenth century, they discovered the ruins of a great civilization, that of the Mayans, who had vanished and left evidence of their lost grandeur in massive structures that had been overwhelmed by the surrounding rain forest. The native people could not explain the significance of the sprawling, vacant cities to the conquistadors. Unlike the great Incan cities, the Mayan centres had long been abandoned. The ruins of the Mayans did not begin to reveal their secrets for 300 years. Since the nineteenth century, enough information has been gathered about the Mayan structures to sketch a history of their development, but the reasons why the great structures were suddenly abandoned, and the exact purposes of the massive and elaborate buildings, continue to remain trapped in the past. The Mayan empire stretched south from the present-day Mexican states of Veracruz, Yucatán, Campeche, Tabasco, and Chiapas to almost all of Guatemala and parts of Belize and Honduras. Ruins in the Guatemalan highlands include Copán, a typical Mayan center with plazas, pyramids, a court for ball games, and blocks of stone inscribed with hieroglyphics. Tikal, another Mayan center in Guatemala, had more than 3,000 structures in a six-square-mile area. Vast palaces with hundreds of rooms, rows and rows of wooden huts, and increasingly larger buildings approaching the center of Tikal accommodated a surrounding community that may have numbered as many as 90,000 people. Palenque is among the centres in the middle area of the Mayan region, where the rain forest is thickest. Among the finds there is the Temple of Inscriptions, a 65-foot-high pyramid. A secret passageway was found by archaeologists in 1952 that led to an elaborate tomb. Riches of jade, finely carved, life sized statues, and an elaborately sculpted sarcophagus were discovered. When modern archaeologists finally mastered Mayan hieroglyphics in the 1970s, inscriptions on the wall of the temple were deciphered. They identified the corpse as Sun Lord Pacal and described his life. Tracing references of dates with the Mayan calendar, another example of Mayan achievement, archaeologists were able to determine that Sun Lord Pacal wasborn in 603, ascended to the throne in 614, and died in 683. The 69 steps that run up the front of the temple each represent a year of his reign. The various ruins were not excavated and examined until the latter half of the nineteenth century. They show that Mayans developed systems of mathematics, writing, and astronomy and erected monumental forms of architecture. 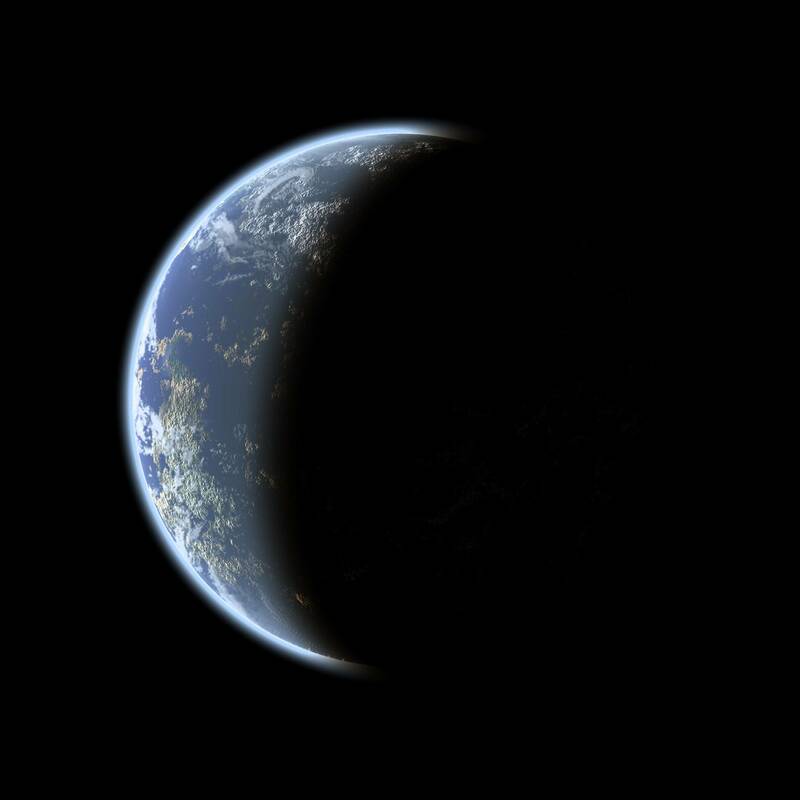 Subsequent discoveries showed their calendar recorded dates as far back as 600 B.C.E. By the first century B.C.E., they specifically used a calendar that had 18 20-day months—matching the Mayan base- 20 mathematical system (the contemporary mathematical system used in the West is base-10). Because of the state of decline in which the conquistadors found Native Americans of the region, and fuelled by cultural bias that made Europeans sceptical that less-advanced people could create such monumental structures, many early explorers believed that the engineering feats of the Mayans had been directed by peoples from the eastern Mediterranean region. Phoenicians and Egyptians had been seafaring people in ancient times. Perhaps they had sailed across the Atlantic Ocean. Those who believed such theories speculated that the Mediterranean seafarers had directed the Mayans to build pyramids, taught them hieroglyphics, and brought them social order. Variations on the theme of an external influence on the ancient Mayans continued to develop. Instead of Egyptians or Phoenicians, however, it was advanced Asians who first reached the Mayans and taught them secrets of architecture and mathematics, written language and astronomy. Or perhaps inhabitants of the legendary continent of Atlantis spread their knowledge to various peoples of the world, including the Mayans. Excavations helped clarify some of the mysteries involving the Mayans. They had distinctive cultural traits evident in similarities of architecture—including pyramids, terraces, and ball courts—and artistic styles of paintings and pottery spread throughout their empire. When modern archaeologists learned how to read Mayan hieroglyphics by establishing meanings and patterns in the images, a history emerged that showed the Mayan centres were not occupied by peaceful astronomers and the large structures did not serve specifically as ceremonial sites. Instead, the hieroglyphics boasted of the accomplishments of a war-like elite. Many of the great Mayan buildings were monuments to great military leaders. Settlements with large structures served as centres for trade, but primarily for the accumulation of riches for the elite of Mayan society. Those who contributed to culture, artisans and astronomers among them, were highly esteemed, but a ruling elite held the riches and the power. The Mayans learned to grow maize, beans, squash, and cacao. They raised cotton and developed a textile industry for spinning, dyeing, and weaving cloth, but they did not develop metal tools, domesticate large beasts of burden, and, in spite of building an elaborate system of roads, did not develop the wheel. Over the centuries, the Mayans domesticated the dog and the turkey, and they discovered how to mine copper, gold, silver, and jade, creating valuable and prized items. 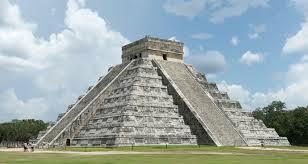 From 800 to 500 B.C.E., the Mayans began erecting modest burial monuments, which bycirca 400 B.C.E. to 250 C.E. had evolved into terraced, pyramidal shapes. The Mayan pyramids differ from those in Egypt, where the sides of the structures converge to form a pointed top. The pyramidal structures of the Mayans reach a certain height, then level off to form a flat platform on which temples were built. Mayan civilization thrived until around 800 when a decline began. Tikal was abandoned, and the process of recording events stopped there by 900. Building began in another center, Seibal, in the southern lowlands in 830 but ended abruptly around 900. Uxmal showed more development around 850, but it was abandoned around 925. Chichen Itza was abandoned around 987. It was subsequently occupied, like some of the other centres, but new massive structures were not built and the old temples did not serve the same functions as they had in the past. In 2000, near the present-day village of Cancuen, Guatemala, a Mayan palace was discovered in a long-abandoned city named the Place of Serpents that is estimated to cover an area as large as two football fields. With 170 high-ceiling rooms and 11 courtyards, the palace was revealed to have been a prosperous center of commerce and crafts. Inscriptions on the palace walls showed that it was completed by a leader named Tah ak Chaan, who ruled over Cancuen from 740 to around 790. Unlike other Mayan centres, there are as yet no indications that the rulers of the area engaged in warfare. There are no pyramids in the area, or outdoor plazas, and there appears to be a complete absence of religious symbols or any indications of the ceremonies evident in other Mayan centres. Rulers of the city appeared to specialize in commerce, not warfare, and a larger working-class group of people seemed to live in the Place of Serpents than at other Mayan centres. Hundreds of workshops where artisans plied their crafts were found. What factors caused the demise of the Mayan empire remains a mystery. Destruction from earthquakes is evident in some Mayan centres, but not all, and earthquakes are not believed to have levelled any of the major centres. There is no evidence of mass burials that would indicate an epidemic, such as plague, small pox, or other infectious diseases that swept through Europe during the same time as the Mayan’s golden era and downfall. An isolated disruption caused by conquerors from the north, a natural catastrophe, or war among leaders of Mayan centres would have affected trade routes that ran through the interior. Tikal, a major inland center dependent on trade, would certainly have been affected by such a disruption. Twice, in the sixth and ninth centuries, Tikal seems to have undergone some form of chaos. The great success of the Mayan culture may be a plausible reason for their downfall. As the population grew, the stress on agriculture became greater, for an expanding population requires consistently more food production. Soil erosion or drought would have greatly affected the large settlements. A decrease in production would have led to malnutrition, increasing the likeliness of disease. Some human skeletal remains from the period show signs of malnutrition, but no conclusive evidence has been found to determine a sudden, widespread catastrophe. Noah's Ark is the vessel, which, according to the book of genesis, was built by Noah at God's command to save himself, his family and the world's animals from a worldwide deluge. The story features in a number of Abrahamic religions including Judaism, Christianity and Islam. Petra ("petra-πέτρα" = cleft in the rock in Greek; Arabic: البتراء, Al-Batrāʾ) is an archaeological site in the Arabah, Ma'an Governorate, Jordan, lies within a ring of forbidding sandstone mountains, in a basin among the mountains which form the eastern flank of Arabah (Wadi Araba), the large valley running from the Dead Sea to the Gulf of Aqaba. It is renowned for its rock-cut architecture. Petra is also one of the new wonders of the world. It was famously described as "a rose-red city half as old as time" in a Newdigate prize-winning sonnet by John William Burgon. UNESCO has described it as "one of the most precious cultural properties of man's cultural heritage." In 1985, Petra was designated a World Heritage Site. Even today this spectacular complex of temples, tombs, and houses can only be accessed on foot or on horseback. Entrance to Petra is via a dark winding crevice in the rock, known as the siq (cleft in Arabic), which is in places as little as a few feet wide. This great mystery of the desert contains nearly 1,000 monuments, and once possessed fountains, gardens, and a permanent water supply. But why was it carved out of the sandstone in such a secluded, arid location? Who built this majestic and what happened to its inhabitants? The earliest known population of Petra was a Semitic-speaking tribe known as the Edomites, mentioned in the Bible as descendents of Esau. But it was a culture called Nabateans who were responsible for most of the incredible architecture at Petra. The Nabatenas were a nomadic Arabic origin, but by the fourth century B.C., had begun to settle down in various parts of Palestine and southern Jordan, and around this time they made Petra their capital city. The naturally fortified position of the site on a trade route between Arabian, Assyrian, Egyptian, Greek, and Roman cultures allowed the strength of the Nabateans to grow. Gaining control of the caravan route between Arabia and Syria, the Nabatenas soon developed a commercial empire that extended as far north as Syria, and the city of Petra became the center for the spice trade. The wealth accumulated by the Nabateans at Petra (through their commercial enterprise) allowed them to build and carve in a style that combined native traditions with Hellenistic (Greek) influence. One of the Nabateans most outstanding achievements at Petra sprang from necessity. 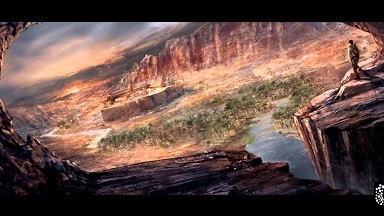 Their city lay on the edge of the parchod desert, so a water supply was a prime concern. Consequently, they developed highly sophisticated dams, as well as water conservation and irrigation systems. But the wealth of the Nabateans brought the envy of their neighbors and they were forced to repel several attacks against their capital during the late fourth century B.C., by the Seleucid king Antigonus. The Seleucid Empire was founded in 312 B.C. by Seleucus I, one of Alexander the Great’s generals, and included much of the eastern part of Alexander’s Empire. In 64-63 B.C., the Nabateans were conquered by the Roman general Pompey, and in A.D. 107, under the Emperor Trajan, the area became part of the Roman province of Arabia Petraea. Despite the conquest, Petra continued to thrive during the Roman period, and various structures, including a vast theatre, a colonnaded street, and a Triumphal Arch across the siq, were added to the city. It has been estimated that the population of Petra may have been as great as 20,000 to 30,000 at its height. However, as the importance of the city of Palmyra, in central Syria, grew on a trade route linking Persia, India, China, and the Roman Empire, Petra’s commercial activity began to decline. In the fourth century, Petra became part of the Christian Byzantine Empire, but in A.D. 363 the free-standing parts of the city were destroyed in a devastating earthquake, and it is around this time that the Nabateans seem to have left the city. No one is sure exactly why they abandoned the site, but it seems unlikely they deserted their capital because of the earthquake, as very valuable finds have been unearthed at the site, indicating that their departure was not a sudden one. A further catastrophic earthquake in A.D. 551 practically ruined the city, and by the time of the Muslim conquest in the 7th century A.D., Petra was beginning to slip into obscurity. There was another damaging earthquake in A.D. 747 that further structurally wakened the city, after which there was silence until the early 12th century and the arrival of the crusaders, who built a small fort inside the city. After the crusaders left in the 13th century, Petra was left in the hands of sandstorms and floods, which buried a large part of the once great city until even its ruins were forgotten. It was not until 1812 that an Anglo-Swiss explorer named Johann Ludwig Burckhardt rediscovered the lost city of Petra and brought it to the attention of the western world. Burckhardt had been travelling in the near east disguised as a Muslim trader (under the name of Sheiks Ibrahim Ibn Abdullah) in order to acquire knowledge and experience oriental life. While in Eiji, a small settlement just outside Petra, Burckhardt heard talk of a lost city hidden in the mountains of Wadi Mousa. Posing as a pilgrim wishing to make a sacrifice at the ancient site, he persuaded two of the Bedouin inhabitants of the village to guide him through the narrow siq. The explorer did, however manage to produce a map of the ruins and made an entry in his journal to the effect that he had rediscovered Petra. Since the time of Burckhardt, the purpose of the rock-cut city of Petra, hidden away in such a secret location, has puzzled many a traveller, scholar, and archaeologist. The magnificent entrance to the site is the more than a mile-long siq, or narrow gorge that winds through the soaring golden-brown sandstone cliffs. There are many small nabateans tombs carved into the cliff walls of the siq, as well as evidence for the skill of the Nabateans as a hydraulic engineers, in the form of channels – once containing clay pipes – which originally carried drinking water into the city. A further example of the engineering abilities of the Nabateans can be seen at the right of the entrance to the siq. Now, as 2,000 years ago, after heavy rain, water flows down the Wadi Mousa (Valley of Moses) into the siq and threatens to flood the site of the city. There was a catastrophic flood at petra in 1963, after which the government decided to construct a dam to redirect the flood water. During building, the excavators were astonished to discover that the Nabateans had already built a dam, probably around the 2nd century B.C., to redirect the flood water away from the entrance and to the north, via an ingenious system of tunnels, which eventually diverted the water back into the heart of the city for the use of the population. The siq eventually opens out dramatically to reveal the best known and most impressive of the monuments of Petra, the classically influenced treasury (El-Khazneh in Arabic). The name Treasury originates from a Bedouin legend that pharaoh’s treasure was hidden inside a huge stone urn which stands at the top of the structure. The well-preserved façade of the Treasury, carved out of the solid sandstone rock, is decorated with beautiful columns and elaborate sculptures showing Nabateans deities and mythological characters, and stands 131 feet high and about 88 feet wide. The structure may have served as a royal tomb, perhaps with the king’s burial place in the small chamber at the back, and also seems to have been used as a temple, though to which specific god or gods it was dedicated is not known. One of the few remaining free-standing buildings at Petra is the huge masonry-built Temple of Dushares, also known mysteriously as Qasr al-Bint Firaun (The Castle of Pharaoh’s daughter). This extensively restored large yellow sandstone temple stands upon a raised platform and has massive 75 feet high walls. The temple, built sometime between 30 B.C. and A.D. 40 was dedicated to dushares, the chief god of the Nabateans, and has the largest façade of any building in Petra. Inside, the building is separated into three rooms, the middle room serving as the sanctuary, or holy of holies. Facing this structure is the Temple of the Winged lions, named after two eroded lions carved on either side of the doorway. This tructure, the most important Nabatean temple ever discovered, has been the subject of more than 20 years of research and excavation by the American Expedition to Petra. The temple was founded in August A.D. 28 and was destroyed in the May A.D. 363 earthquake that brought down many of the city’s buildings. The largest monument in Petra and one of the most striking is El-Deir (the Monastery), acquiring the name from its use as a church during the Byzantine period (A.D. 330 – A.D. 1453). The spectacularly situated structure, high up on the mountain, is 164 feet wide and 148 feet high, with its great doorway measuring around 26 feet in height. The structure is carved, as with the Treasury, into the side of a cliff face. 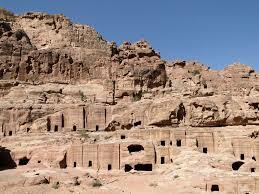 In fact, the Monastery is similar to a larger, rougher, weather-beaten version of the more famous Petra monument. Archaeologists believe that construction of El-Deir began during the reign of Nabatean King Rabel II (A.D. 76 – 106), but was never completed. But what exactly was the function of this strange place – was it a fortress, a commercial center, or a sacred city? There are many royal tombs throughout the site, as well as public tombs and shaft tombs (the latter places are apparently where criminals were buried alive). But evidence from archaeological investigations over the past decade or so suggests Petra may have had many different functions over the hundreds of years it was inhabited. The picturesque site is a popular sight and featured in various works of art such as the movies Indiana Jones and the Last Crusade (1989), Passion in the Desert, Mortal Kombat: Annihilation, Sinbad and the Eye of the Tiger, and the Sisters of Mercy music video "Dominion", and the upcoming Transformers: Revenge of the Fallen. It was recreated for the video games Spy Hunter (2001), King's Quest V, Lego Indiana Jones and Sonic Unleashed and appeared in the novels "Left Behind", "Appointment with Death", "The Eagle in the Sand" and "The Red Sea Sharks", in The Adventures of Tintin. It also featured prominently in the Marcus Didius Falco mystery novel "Last Act in Palmyra". The Holy Lance (also known as the Spear of Destiny, Holy Spear, Lance of Longinus, Spear of Longinus or Spear of Christ) is the name given to the lance that pierced Jesus's side in John's account of the crucifixion of Jesus. The lance is mentioned only in the Gospel of John (19:31–37) and not in any of the Synoptic Gospels. The gospel states that the Romans planned to break Jesus' legs, a practice known as crurifragium, which was a method of hastening the death during a crucifixion. Just before they did so, they realized that Jesus was already dead and that there was no reason to break his legs. To make sure that he was dead, a Roman Centurion named in extra-Biblical tradition as Longinus stabbed him in the side. The phenomenon of blood and water was considered a miracle by Origen (although the water may be explained biologically by the piercing of the pericardial sinus secondary to cardiac tamponade.) Catholics generally choose to employ a more allegorical interpretation: it represents the Church (and more specifically, the sacraments of Baptism and the Eucharist) issuing from the side of Christ, just as Eve was taken from the side of Adam. The earliest mention of a relic preserved as the Holy Lance is in the account of the pilgrim Antoninus of Piacenza, about 570, who described the holy places of Jerusalem, where he saw in the basilica of Mount Zion "the crown of thorns with which Our Lord was crowned and the lance with which He was struck in the side". According to the Catholic Encyclopedia, the presence in Jerusalem of this relic is attested half a century earlier by Cassiodorus and was known to Gregory of Tours. In 615 Jerusalem was captured for the Persian King Khosrau II; according to the Chronicon Paschale, the iron point of the lance, which had been broken off, was given in the same year to Nicetas, who took it to Constantinople and deposited it in the church of Hagia Sophia. This lance-point, embedded in an icon, was obtained in 1244 from the Latin emperor at Constantinople, Baldwin II, by Louis IX of France, who enshrined it with his relic of the Crown of Thorns in the Sainte Chapelle, Paris. Hitler's successes as Nazi dictator have given way to a number of occult theories. One of the most common of these is the story of the Spear of Destiny. Also called the Holy Lance, this spear was believed to have been the weapon used to pierce the side of Jesus Christ at the Crucifixion. Legend has it that whoever possesses the lance will rule the world. The lance appears both in factual history and in fiction. In the Wagner opera Parsival, Klingsor was a despicable adversary of the Knights of the Holy Grail. The fiend sought to capture the Spear of Destiny from them and use it in his practice of black magic. In history, no figure was more feared than the black magician Landulph II of Capua. He, too, was obsessed with the power of the Spear of Destiny. Hitler identified the similarities between Wagner's character and the magician. He saw their struggles as parallel to his own quest for the holy icon. To Hitler, the blood purity of the Grail Knights and the maniacal quest of Klingsor and Landulph for the spear was the blueprint for world conquest by Nazi power. Hitler believed he would one day fulfill a historic destiny. How he would do this was not clear until he was 21. While in the Hapsburg Treasure House in Vienna, Austria, Hitler heard the words which he said were to change his whole life. A museum tour guide stopped in front of a display of an ancient spear and told of a legend that whoever possessed it would hold the destiny of the world. The guide said the spear was supposedly the one which a Roman Centurion thrust into the side of Jesus Christ at the Crucifixion. After the group departed, Hitler stepped forward for a closer look. "I knew with immediacy that this was an important moment in my life, and yet I could not divine why an outwardly Christian symbol should make such an impression on me," he said later. After his initial experience with the Spear of Destiny, Hitler studied the history of the ancient relic. He was intrigued and amazed at its incredible story.For more than 1,000 years, the spear had been a symbol of power to the emperors of the Holy Roman Empire. Century after century, the legend of the Spear had been fulfilled for good or evil. Constantine the Great claimed the spear guided him through providence. The Frankish General Karl Martel used the spear in battle. Emperor Charlemagne lived and slept within reach of the spear, and attributed 47 battle victories to its powers. In all, 45 emperors over 1,000 years claimed the Spear of Destiny as a possession.Hitler decided he had to possess it. Over the next three years, he made countless trips to the museum to gaze in awe at the spear. He recalled that one day as he stood in front of the display, he went into a trance. "I slowly became aware of a mighty presence around it -- the same awesome presence which I had experienced inwardly on those rare occasions in my life when I had sensed that a great destiny awaited me." In 1933, when Hitler rose to power, his 25-year obsession to possess the spear could be realized. In April, 1938, he marched his army into Vienna and took possession of the spear and took it to Nuremberg. One year later, he invaded Poland.On April 30, 1945, the same day Hitler supposedly killed himself, the American army invaded Nuremberg and took possession of the spear. In the months that followed, America unleashed the most destructive force ever known to man: the atomic bomb. While in possession of the Spear of Destiny, America became the undisputed ruler of the world. 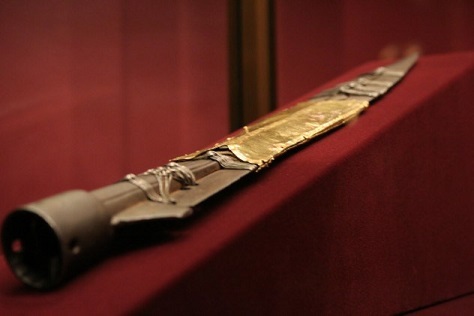 The spear now once again resides in the Hapsburg Treasure House Museum in Vienna. Trevor Ravenscroft’s 1973 The Spear of Destiny (as well as a later book The Mark of the Beast) claims that Adolf Hitler started World War II in order to capture the spear, with which he was obsessed. At the end of the war the spear came into the hands of US General George Patton. According to legend, losing the spear would result in death, and that was fulfilled when Hitler committed suicide. Ravenscroft repeatedly attempted to define the mysterious “powers” that the legend says the spear serves. He found it to be a hostile and evil spirit, which he sometimes referred to as the Antichrist, though that is open to interpretation. He never actually referred to the spear as spiritually controlled, but rather as intertwined with all of mankind's ambitions. Despite publishing his findings in a supposed non-fiction book, Ravenscroft successfully sued James Herbert, claiming Herbert's 1978 novel The Spear infringed on Ravenscroft's copyright. This case is similar to the Dan Brown and Holy Blood, Holy Grail case. Dr. Howard A. Buechner, M.D., professor of medicine at Tulane and then LSU, wrote two books on the spear. Buechner was a retired colonel with the U.S. Army who served in World War II and had written a book about the Dachau massacre. He claims he was contacted by a former U-boat submariner, the pseudonymous “Capt. Wilhelm Bernhart,” who claimed the spear currently on display in Vienna is a fake. "Bernhart" said the real spear was sent by Hitler to Antarctica along with other Nazi treasures, under the command of Col. Maximilian Hartmann. In 1979 Hartmann allegedly recovered the treasures. Bernhart presented Buechner with the log from this expedition as well as pictures of the objects recovered, claiming that after the Spear of Destiny was recovered, it was hidden somewhere in Europe by a Nazi secret society. After contacting most of the members of the alleged expedition and others involved, including Hitler Youth Leader Artur Axmann, Buechner became convinced the claims were true. In Ancient Egyptian mythology, a sphinx is a zoomorphic figure, usually depicted as a recumbent lioness or lion with a human head, but occasionally with the head of a falcon, hawk, or ram. The figure had its origin in the Old Kingdom and is associated with the solar deity Sekhmet, who also was the fierce war deity and protector of the pharaohs. She remained a strong figure in Egyptian religion throughout its history, even during the Amarna period's temporary exploration of monotheism. The sphinxes were often described as Sekhmet's children. The use of heads of other animals atop the lioness body followed the titular deities of the city or region where they were built or which were prominent in the Egyptian pantheon at the time. Later, the sphinx image, or something very similar to the original Egyptian concept, was imported into many other cultures, albeit often interpreted quite differently due to translations of descriptions of the originals and the evolution of the concept in relation to other cultural traditions. Perhaps the first sphinx, Hetepheres II from the fourth dynasty (Cairo Museum) Generally the role of sphinxes was as temple guardians; they were placed in association with architectural structures such as royal tombs or religious temples. Perhaps the first sphinx was one depicting Hetepheres II, of the fourth dynasty that lasted from 2723 to 2563 BC. The largest and most famous is the Great Sphinx of Giza, sited at the Giza Plateau on the west bank of the Nile River and facing due east, is also from the same dynasty. Although the date of its construction is uncertain, the head of the Great Sphinx now is believed to be that of the pharaoh Khafra. Avenue of ram-headed sphinxes at Karnak in Luxor dating to the eighteenth dynasty What names their builders gave to these statues is not known. At the Great Sphinx site, the inscription on a stele erected a thousand years later, by Thutmose IV in 1400 BCE, lists the names of three aspects of the local sun deity of that period, Khepera - Re - Atum. The inclusion of these figures in tomb and temple complexes quickly became traditional and many pharaohs had their heads carved atop the guardian statues for their tombs to show their close relationship with the powerful deity, Sekhmet. Other famous Egyptian sphinxes include one bearing the head of the pharaoh Hatshepsut, with her likeness carved in granite, which is now in the Metropolitan Museum of Art in New York, and the alabaster sphinx of Memphis, currently located within the open-air museum at that site. The theme was expanded to form great avenues of guardian sphinxes lining the approaches to tombs and temples as well as serving as details atop the posts of flights of stairs to very grand complexes. Nine hundred with rams' heads, representing Amon, were built in Thebes, where his cult was strongest. From the Bronze Age the Hellenes had trade and cultural contacts with Egypt. Before the time that Alexander the Great occupied Egypt their name, sphinx, was already applied to these statues. The historians and geographers of Greece wrote extensively about Egyptian culture. They sometimes called the ram-headed sphinxes, criosphinxes and the bird-headed ones, hierocosphinxes. 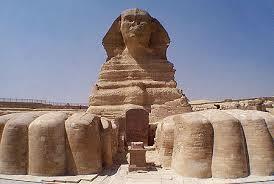 The word "Sphinx" comes from the Greek Σφιγξ — Sphingx, apparently from the verb σφιγγω — sphinggo, meaning "to strangle". This name may be derived from the fact that the hunters for a pride of lions are the lionesses, and they kill their prey by strangulation, biting the throat of prey and holding them down until they die. The word "sphincter" derives from the same root. There was a single Sphinx in Greek mythology, a unique demon of destruction and bad luck. According to Hesiod she was a daughter of Echidna and Orthrus; according to others, she was a daughter of Echidna and Typhon. All of these are chthonic figures from the earliest of Greek myths, before the Olympians ruled the Greek pantheon. She was represented in vase-painting and bas-reliefs most often seated upright rather than recumbent, as a winged lion with a woman's head; or she was a woman with the paws, claws and breasts of a lion, a serpent's tail and eagle wings. The Sphinx was the emblem of the ancient city-state of Chios, and appeared on seals and the obverse side of coins from the sixth century BC until the third century AD. The Sphinx is said to have guarded the entrance to the Greek city of Thebes, and to have asked a riddle of travelers to obtain passage. The exact riddle asked by the Sphinx was not specified by early tellers of the stories about the sphinx, and was not standardized as the one given below until late in Greek history. It was said in late lore that Hera or Ares sent the Sphinx from her Ethiopian homeland (the Greeks always remembered the foreign origin of the Sphinx) to Thebes in Greece where, in the writings of Sophocles, Oedipus Tyrannus, she asks all passersby history's most famous riddle: "Which creature in the morning goes on four feet, at noon on two, and in the evening upon three?" She strangled and devoured anyone unable to answer. Oedipus solved the riddle: answering, Man—who crawls on all fours as a baby, then walks on two feet as an adult, and walks with a cane in old age. Bested at last, the tale continues, the Sphinx then threw herself from her high rock and died. An alternative version tells that she devoured herself. Thus Oedipus can be recognized as a liminal or "threshold" figure, helping effect the transition between the old religious practices, represented by the death of the Sphinx, and the rise of the new, Olympian deities. The site was used as a cemetery for 500 years, from the point of its inception. Archaeologists have said the cremation burials found at the site might represent a single elite family and its descendents - perhaps a ruling dynasty. One clue to this idea is that there are few burials in the earliest phase, but that the number grows larger in later centuries, as offspring multiplied. Under the traditional view, cremation burials were dug at the site between 2,700 BC and 2,600 BC, about a century before the large stones - known as sarsens - were put in place. The second burial, from the ditch surrounding Stonehenge, is that of an adult and dates to between 2,930 BC and 2,870 BC. The most recent cremation comes from the ditch's northern side and was of a 25-year-old woman; it dates to between 2,570 BC and 2,340 BC, around the time the first arrangements of sarsen stones appeared at Stonehenge. Two other Stonehenge experts, Professor Tim Darvill, from the University of Bournemouth, and Professor Geoff Wainwright, from the Society of Antiquaries, have a different theory about the monument. They are convinced that the dominating feature on Salisbury Plain in Wiltshire was akin to a "Neolithic Lourdes" - a place where people went on a pilgrimage to get cured. They recently carried out a two-week excavation at the site to search for clues to why the 4,500-year-old landmark was erected. New radiocarbon dates of human remains excavated from the ancient stone monument in southwest England suggest it was used as a cemetery from its inception just after 3000 BC until well after the larger circle of stones went up around 2500 BC. 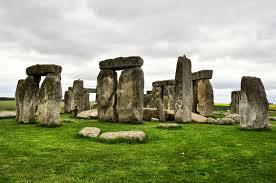 Previously, archaeologists had believed people were buried at Stonehenge between 2700 and 2600 BC. "The hypothesis we are working on is that Stonehenge represents a place of the dead," said Mike Parker Pearson, an archaeologist at the University of Sheffield, who is leading an excavation of the site. "That seems to be very clear." "A further twist is that the people buried at Stonehenge may have been the elite of their society, an ancient royal British dynasty, perhaps." Built between 3000 and 1600 BC as a temple, burial ground, astronomical calendar or all three, the stone circle is sometimes called "Britain's pyramids". Tourists are drawn to Stonehenge throughout the year and on the summer solstice -- the longest day of the year in the northern hemisphere -- up to 30,000 revellers and druids converge on the stones for a night of celebration. Who built Stonehenge and why is debated among scientists, although growing evidence points to the monument's use as a burial place, Parker Pearson told reporters. Last year the same researchers found evidence of a large settlement of houses nearby. They said the latest findings reinforced their belief that the settlement and Stonehenge form part of a larger ancient ceremonial complex along the nearby River Avon. "What we suspect is that the river is the conduit between the two realms of the living and the dead," Parker Pearson said. "It was the prehistoric version of the river Styx." The team estimates that between 150 to 240 men, women and children were buried at Stonehenge over a 600-year period, making it likely that the relatively low figure over such a long points to a single elite family. A clue is the few burials in Stonehenge's earliest phase, a number that grows larger in following centuries as offspring would have multiplied, said Andrew Chamberlain, a specialist in ancient demography at the University of Sheffield. Placement of the graves and artefacts such as a small stone mace are evidence the site was reserved as a "domain of the dead" for the elite, Parker Pearson added. "I don't think it was the common people getting buried at Stonehenge -- it was clearly a special place at the time," he said. "One has to assume anyone buried there had some good credentials." I propose that the king’s true tomb was located beneath the Pyramid, at ground level, where it probably remains hidden to this day. 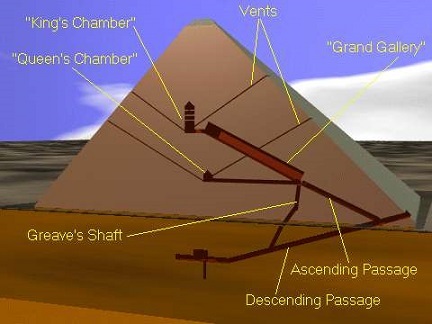 The Pyramid, in its lower parts, was thus a tomb, incorporating an ingenious decoy arrangement. Teotihuacán is located in the central section of the Valley of Teotihuacán, 25 miles (45 km) northeast of Mexico City, The site covers a total surface area of 83 km² and was made a UNESCO World Heritage Site in 1987, and is one of the most visited archaeological sites in Mexico. The holy city of Teotihuacán is dominated by two massive pyramids. The twin pyramids are the larg­est artificial mounds on both American continents. The Pyramid of the Moon, a half-mile away (1 km), is half the size and The Pyramid of the Sun at Teotihuacán, which is aligned with the solstice, is as old as any Maya structure and 20 times as big. The Pyramid of the Sun is 208 feet tall (64 m) and is about one-half the size, in total volume, of the Great Pyramid in Egypt. The sacred peak of Cerro Gordo, (Fat Hill) looms in the distance overlooking the ancient metropolis. Of all the ancient cities of the Americas, Teotihuacán is the most enigmatic. Nobody knows what race of people built it, what they used it for, or why it was abandoned. Teotihuacan is an enormous archaeological site in the Basin of Mexico, containing some of the largest pyramidal structures built in the pre-Columbian Americas. Apart from the pyramidal structures, the archaeological site of Teotihuacan is also known for its large residential complexes, the so-called "street of the dead", and its colorful well-preserved murals. Located on the largest pyramid are the so-called “glimmer chambers,” which are rumored to be hidden behind padlocked doors. These little-known inner rooms may have been initiation chambers, but admission is not permitted and there is now evidence that this section has been recently sealed up with con­crete. The Pyramid of the Sun was built directly over a four-chambered lava tube in the second century CE. The sides of the Pyramid of the Sun are terraced, and wide stairs lead to the summit. Unfortunately, the surface was restored using the wrong materials to wrong specifications in 1910, and has become a distorted version of the original appearance. 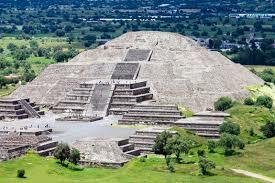 Of all the peoples who created the Mexican upland cultures in Maya times, only those in the Valley of Mexico and the Zapotecs built lavish burial chambers, while the people of Teotihuacán raised mighty pyramids. By 300 CE, Teotihuacán was the religious and civic center for 100,000 Mesoamericans, boasting plazas lined with palaces and avenues, paved with polished stucco and drained by an elaborate system of underground conduits. The Plumed Serpent Quetzalcoatl is a sign and ornament found all over Mexico. The cult of Quetzalcoatl may have originated at Teotihuacán, but certainly the later conquering Toltecs spread the symbol throughout the whole of Mexico, especially to the cities of the Maya renaissance on the Yucatán peninsula. Indeed, the remains are awe-inspiring, but it is believed that 90 per cent of the city is still buried under the arid Mexican soil. And yet, this great city of culture held 200,000 inhabitants at its peak. So what happened at Teotihuacán? When later Aztec races found this amazing urban development they were so impressed by its construction that they named it ‘Teotihuacán’, meaning ‘The great city where men become gods’. The focal point of the city, which spread over 12 square miles, was an immense building called the Pyramid of the Sun. This 216-foot-tall structure had a temple at its summit which indicated the city was ruled by native religion. At the base of the pyramid ran a north-south avenue, which stretched for almost three miles. The Aztecs called this the ‘Avenue of the Dead’, believing the small platforms that lined the series of connecting courtyards to be tombs. In fact, they were probably temples – it has since been discovered that the Teotihuacáns actually buried the dead in their own houses. At the northern end of the avenue, nearest the Sun Pyramid, there was a slightly smaller construction, named the Pyramid of the Moon. About a mile south down the avenue there was a vast open area called the Citadel. This was also surrounded by temples and had the important Temple of the Feathered Serpent in its centre. Intersecting the Avenue of the Dead at its halfway point was another avenue. The city was therefore based on a grid system of four quarters. The houses in this format were built in complexes of adjoining dwellings, linked by terraces and patios. The building of the city began around 200 BC, with the major structures, like the pyramids, being erected from the first century AD. By the beginning of the fifth century AD, the city covered its maximum surface area, and housed around 100,000 people. Within two centuries this number had doubled. But who were the inhabitants? Although it is a subject of debate whether Teotihuacan was the center of an empire, its influence throughout Mesoamerica is well documented; evidence of Teotihuacan presence, if not outright political and economic control, can be seen at numerous sites in Veracruz and the Maya region. The ethnicity of the inhabitants of Teotihuacan is also a subject of debate and possible candidates are the Nahua, Otomi or Totonac ethnic groups. Often it has been suggested that Teotihuacan was in fact a multiethnic state. Archaeologists and historians really do not know for certain. They were much too early to be Aztecs, and the Toltec race, despite having a similar sense of architecture and civil engineering, did not appear until 200 years after the initial building of Teotihuacán. There is a possibility that the Olmecs, a race of great builders and craftsmen who had flourished between the fifteenth century BC and first century AD, may have been their ancestors. However, there is no proof to confirm this, and the writings and records left by the Teotihuacáns, which would provide us with their own version of their history, have never been successfully translated to. Whoever founded the city did so with intelligent laws and a strict reverence for religious matters. It has been suggested that the city was a major destination for pilgrims and the training centre for priests. Despite the people enjoying a structured, dignified and privileged life, the city of Teotihuacán was largely destroyed by the eighth century AD. One theory is that the population may have been too great for the local resources although this has been countered by the knowledge that the rulers of Teotihuacán were good enough social and civil engineers to provide for this. It is more likely that invading barbarians from the north attacked the city. Indeed, what historians have garnered from Teotihuacán murals suggests the roles of soldiers took on more prominence in the city’s later years. Teotihaucán itself was not designed to repel attacks, and recent excavations have indicated that large, prepared fires were started in the city during its last days. Although the origin of the Teotihuacán race is unknown, the influence it had across the Mexican region has been proven to be immense. Some experts consider the possibility that a mass exodus of Teotihuacán citizens founded another town with structure similar to the earlier pyramids at a site 700 miles away in Kaminaljuyú. But nothing is known for certain. Even after nearly a century of intense historical investigation, the mysterious story of Teotihuacán is as unknown now as it has been for a thousand years. One of the Bibles greatest mysteries and known for its strange powers is described in the Bible as a box about 3 feet by two feet made of acacia wood and plated in pure gold inside and out. There were 4 rings on the sides of the box into which gold covered poles were thread which allowed it to be carried by two priests on their shoulders without it being touched. The holiness of the Ark made it dangerous to those who came in contact with it. On top the Arks lid, also made with pure gold, are two Cherubs with spread wings facing each other with Gods mercy seat between. Gods presence remained over the Ark in between the two Cherubs. 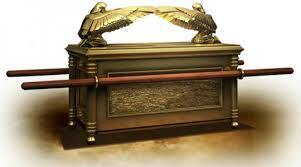 The Ark was the manifestation of God’s Physical presence on the earth (the Shekhina). When God spoke, he did so from between the two cherubs. Once per year on the Day of Atonement (Yom Kippur) the high Priest entered into the Holy of Holies in the Tabernacle where the Ark was placed, with the blood of a goat and sprinkled it onto the mercy seat to ask forgiveness on behalf of his own sins and the sins of the people of Israel. The Tabernacle was the portable Temple used in the desert and during the conquest of the land of Israel. The ten Commandments written upon two tablets of stone, were placed inside by Moses. The Israelites carried the Ark of the Covenant during their wanderings for 40 years in the wilderness and during their battles and conquest of the promised Land. It brought them victory wherever it went and made them a great people. The Bible tells of it inflicting tumours and severe burns, stopping rivers, blasting whole armies and laying waste cities. In the Book of Samuel, the Bible describes a period of seven months during which the Philistines were in possession of the Ark of the Covenant after they had defeated the Israelites in battle. During this time the Philistine people suffered the destruction of their Idol God they worshiped and plagues that went from city to city, wherever they moved the Ark. 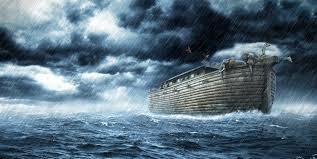 The plagues ceased when they decided to return the Ark to the Israelites and accompainied it with expensive gifts. It stayed for 20 years at Kiriath-Jearim until King David brought it to Jerusalem. Davids son, King Solomon placed it in the Holy of Holies of the First Temple that he built in Jerusalem. The Queen of Sheba supposedly came to visit King Solomon and bore him a son named Menelik who was born in his mothers land and then returned as a man to Jerusalem to meet his father King Solomon. There are some who believe that the Ark went with Menelik when he returned home. In Axum, Ethiopia, it is believed that the Ark is being held in the Church of Saint Mary of Zion guarded by the “Keeper of the Ark” , a monk who claims to have it in his possession. The First Temple was destroyed in 587BC by the Babylonians. It was not in the Second Temple which was built after the Jews returned from their exile in Babylon in 528BC. It is unlikely that the Babylonians took it because the detailed lists of what they took, make no mention of the Ark. At some point between the tenth and the sixth century BC this precious object went missing and vanished without even one comment in the Scriptures. The most precious of all the Biblical Treasures was gone - without a trace. From this, some people assume it was destroyed, however others believe that it was removed and that Priests hid it. Many have tried to figure out whom might have secreted this sacred relic away and piece together where it is now. Treasure Hunters have been seeking it and books have been written about The Ark of Covenant and even a movie “Indiana Jones and the Raiders of the Lost Ark” with Harrison Ford starring was made. Some even say they know where it is but because of the political climate, that it is impossible to retrieve it at this time. The fate of the Ark of Covenant may remain the worlds’ most ancient unsolved mysteries of all time for the foreseeable future. The legend of the Holy Grail is one of the most enduring in Western European literature and art. The Grail was said to be the cup of the Last Supper and at the Crucifixion to have received blood flowing from Christ's side. It was brought to Britain by Joseph of Arimathea, where it lay hidden for centuries. The search for the vessel became the principal quest of the knights of King Arthur. It was believed to be kept in a mysterious castle surrounded by a wasteland and guarded by a custodian called the Fisher King, who suffered from a wound that would not heal. His recovery and the renewal of the blighted lands depended upon the successful completion of the quest. Equally, the self-realisation of the questing knight was assured by finding the Grail. 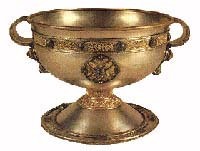 The magical properties attributed to the Holy Grail have been plausibly traced to the magic vessels of Celtic myth that satisfied the tastes and needs of all who ate and drank from them. The Holy Grail first appears in a written text in Chrétien de Troyes's Old French verse romance, the Conte del Graal ('Story of the Grail'), or Perceval, of c.1180. During the next 50 years several works, both in verse and prose, were written although the story, and the principal character, vary from one work to another. In France this process culminated in a cycle of five prose romances telling the history of the Grail from the Crucifixion to the death of Arthur. The Old French romances were translated into other European languages. Among these other versions two stand out: Wolfram von Eschenbach's Parzifal (early 13th century) and Sir Thomas Malory's Morte Darthur (late 15th century). With the passing of the Middle Ages, the Grail disappears until the 19th century when medieval history and legend awoke the interest of writers such as Scott and Tennyson, of the artists of the Pre-Raphaelite Brotherhood, and of composers, notably Richard Wagner. The symbol of the Grail as a mysterious object of search and as the source of the ultimate mystical, or even physical, experience has persisted into the present century in the novels of Charles Williams, C.S. Lewis and John Cowper Powys. Tiahuanaco (Tiawanaku) is an important Pre-Columbian archaeological site in western Bolivia. This site is recognized by Andean scholars as one of the most important precursors to the Inca Empire, flourishing as the ritual and administrative capital of a major state power for approximately five hundred years. The ruins of the ancient city state are near the south-eastern shore of Lake Titicaca, about 72 km (44 miles) west of La Paz, Bolivia. The site was first recorded in written history by Spanish conquistador and self-acclaimed “first chronicler of the Indies” Cieza de Leon. Leon stumbled upon the remains of Tiahuanaco in 1549 while searching for the Inca capital Collasuyu. Some have hypothesized that Tiahuanaco's modern name is related to the Aymara term taypiqala, meaning "stone in the center", alluding to the belief that it lay at the center of the world. However, the name by which Tiahuanaco was known to its inhabitants has been lost, as the people of Tiahuanaco had no written language. The story began in 1549, when Cieza de Leon (1518–1560) heading inland from Lake Titicaca, which separates Peru from the land-locked nation of Bolivia, he found the remains of the fabled city of Tiahuanaco, which were far greater than he had expected. The site of the ancient city features large artificial mounds and massive, carved stones, including an enormous entrance called the Gateway of the Sun. Carved from a single block of stone weighing 10 tons, the Gateway features intricate decorations, including a god-figure often identified as Viracocha, who figured prominently in the mythology of the region. A terraced monument called Akapana, measuring 650 by 600 feet and rising 50 feet high, has a pyramidal shape that levels off to form a high platform. Within that platform are sunken courtyards. Seen throughout Tiahuanaco are skillful examples of masonry and the brilliant use of metals, including copper clamps that hold massive blocks of stones together. The Gateway of the Sun stands on the northwest corner of a platform temple called Kalasasaya, which is adjacent to a semi-underground temple; the temples form part of an astronomical observatory. Some standing stones placed on the site weigh up to 100 tons. Among other remarkable feats, the residents of Tiahuanaco devised a drainage and sewer system. At 12,500 feet of elevation, Tiahuanaco was the highest city of the ancient world. As soon as Cieza de Leon reported the remarkable discovery, Tiahuanaco became one of the world’s great mysteries, for the local Aymara Indians insisted that the ruins were there long before the great Inca civilization came to the area and conquered it around 1450. Christian missionaries followed Cieza de Leon to the ruins, and these men of learning soon doubted whether the Aymara people could ever have been capable of the craftsmanship and engineering such massive structures required. Legends began to be spread by the missionaries that the structures had been erected in the distant past by giants. Scientists date the civilization that occupied Tiahuanaco to 300—when a community first began to settle in the area—to 900, when some kind of disruption occurred and Tiahuanaco was abandoned. 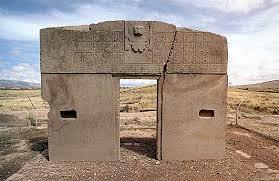 Those dates match the claim of the Aymara Indians that Tiahuanaco was built and lay in ruins before the Incas came. Other theorists blend scientific finds and local myths, perpetuating the notion that a white race, perhaps Egyptians or Phoenicians, brought civilization to the high plain. The argument that Tiahuanaco thrived more than 10 thousand years before the dates established by scientific testing was fostered by Arthur Posnansky in his book, Tiahuanaco: The Cradle of American Man (1945). Noting that the platform temple Kalasasaya was used as an astronomical observatory, Posnansky determined that it pointed precisely to solstice alignments in 15,000 B.C.E. Taking into account the very gradual shifting of Earth’s axis, Posnansky postulated that arid plain was once below water, part of Lake Titicaca, and that Tiahuanaco was once a major port city. The ancient citizens of Tiahuanaco were members of a superior culture who had introduced a golden age to the area. The founders of Tiahuanaco were taller and had distinctive facial characteristics quite apart from the high-cheekboned visages of today’s dwellers of the high plateau. In Posnanksy’s view, the most startling tale told by the few artifacts left in the city was of a New World civilization that was amazingly similar to that of ancient Egypt. The Calassassayax (house of worship), he believed, was so similar to the Egyptian temple of Karnak in design and layout that its relative dimensions made it almost a scale model of the Old World structure. The stones used in the temple at Tiahuanaco are fitted and joined with their joints and facing parts polished to make a nearly perfect match. The Incas did not build in such a manner, but the ancient Egyptians did. And then there were the buildings constructed of massive, polished stones, many tons in weight, that had been placed in such a manner that only a people with advanced engineering methods could have designed and transported them. If this were not enough of an impossible situation, the particular andesite used in much of the Tiahuanacan construction can only be found in a quarry that lies 50 miles away in the mountains. The surgeons of Tiahuanaco were skilled in trepanning the brain, as were the Egyptian physicians. Posnansky uncovered skulls with well-healed bone grafts, which offered silent testimony to the skill of the ancient doctors and their knowledge of anatomy. Some archaeologists receptive to Posnansky’s theories argue that the credibility of cultural coincidence is stretched considerably when related to brain operations. It is possible to accept the fact that two widely separated cultures, such as the Egyptians and the unknown people of Tiahuanaco, may have developed a form of brain operation, but that both cultures used identical instruments and methods, seems unusual to say the least. The instruments are of high-grade copper and include drills and chisels. In themselves they indicate an advanced degree of metallurgy, knowledge of simple machinery, and development of surgical practices far more detailed than can be expected in primitive societies. Posnansky’s theories won a popular readership, but were not widely accepted among scientists. At sunrise on dates of the equinox, for example, the Sun appears on the staircase of Kakassasaya. There is no need to believe that it was built at a precise time to point to a precise astronomical alignment. The port city idea was also quickly disputed. Areas that would have been submerged included neighborhoods of dwellings that share similar dates with the larger structures, and the surrounding countryside where farms were located also would have been underwater. Radiocarbon dating suggests instead that Tiahuanaco was founded around 400, and after three centuries of gradual settlement, the city was abandoned around 1000. In the interim, the settlement had grown from a ceremonial center to a major city inhabited by 40,000 to 80,000 people. Regular archaeological excavations have been underway in Tiahuanaco since 1877. The semi-subterranean temple next to the Akapana yielded a 24-foot tall monolith in 1932. That find and the generally arid climate helped sustain the idea that Tiahuanaco served primarily as a ceremonial center. Later finds, however, showed that it had been a thriving city, and dates for the time settlement and abandonment were established. Why the place was abandoned, however, remains a mystery to conventional archaeologists. However, according to Posnansky, it was the climactic changes at the end of the Ice Age that contributed to flooding and the destruction of Tiahuanaco, wiping out its inhabitants and leaving the great structures in ruins. Posnansky died in 1946, convinced that he had traced the influence of Tiahuanaco on the native culture as far north as the coastal deserts of Peru and as far south as Argentina. Most other archaeologists take much more conservative views. As with the Mayans, they argue, the ancient Indians of Tiahuanaco might have had too much of a good thing. There is evidence that they were victims of a natural catastrophe, but it was a prolonged drought, rather than Posnansky’s great flood, that probably overwhelmed them. Drought conditions set in for an extended period, and the Aymara could no longer support a massive population and large-scale construction projects. People began abandoning the city around 1000. The Incas conquered communities remaining in the area around 1450. Then the Spanish came to Tiahuanaco about one hundred years after the Incas had moved in. Still the questions remain: just who were the natives that thrived at Tiahuanaco and how did they construct such elaborate structures? The Aymara, meanwhile, still live in the region. They outlasted the early Spanish settlers around Tiahuanaco, who never quite mastered the area’s harsh conditions. The plain became a desert again after the Spanish farmed it, for they never learned to use a technique of the ancient dwellers of Tiahuanaco. The mysterious unknown people farmed on raised fields, which were filled and built up with soil from surrounding areas. Canals between the fields kept them watered, and by farming on raised fields the crops were kept safe from the danger of frost and erosion by water. In the late nineteenth century a young English archaeologist by the name of Howard Carter was convinced that the remains of the ‘Boy King’, the pharaoh Tutenkhamun, lay undisturbed somewhere in Egypt. Carter first arrived in Egypt in 1891, and eventually secured funding for his archaeological digs from the wealthy Lord Carnarvon in 1917. After five years of little success, Carnarvon gave Carter one last season of financial support. On 4th November 1922, Carter’s team found a step cut into the rock floor of the Valley of the Kings. As they dug and removed the covering material, they discovered a set of steps that ended at a door inscribed with the name ‘Tutenkhamun’. Carter ruled that they would do no more digging until Lord Carnarvon reached the site, and immediately sent a telegram back to Britain. Carnarvon travelled to Egypt and together he and Carter entered the tomb. They discovered a fake room, a storage room and then the burial chamber. Unlike other pharaohs, Tutenkhamun had lain undisturbed since death, and when Carter had peered in by candlelight he discovered an untold array of treasures. The team catalogued and recorded all the items they found, the most impressive of which was the king’s sarcophagus – three interlocking coffins, the last of which depicted the earthly form of Tutenkhamun in beautiful gold metalwork. Inside this lay the mummified body of the Boy King. Everyone celebrated at finding an unplundered tomb, and Carter’s team felt vindicated in their search. However, there were rumours that Carter had removed a sign above the tomb door that read ‘Death shall come on swift wings to him that toucheth the tomb of the Pharaoh’. In the spring of 1923, Lord Carnarvon was bitten on the neck by a mosquito. He accidentally cut the bite whilst shaving, and the wound became infected. He started suffering fevers and chills and died shortly after in Cairo hospital. It is believed all the lights in the hospital went out when he passed away, and his favourite dog back in England is said to have howled and dropped dead the same instant. The press had a field day, claiming it was the curse of the pharaoh – strangely, when the mummy was unwrapped, it had a bite on the cheek in exactly the same place as Carnarvon’s had been. Over the next few years, two of Carnarvon’s relatives, Carter’s personal secretary and several others connected with the discovery were said to have died in strange circumstances. Each time one died, the British media linked the death to the curse. 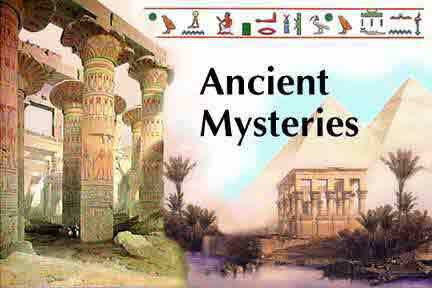 Some historians believe that the Ancient Egyptians placed poison inside the tombs to gain vengeance on grave robbers. Scientists have also advanced many theories in recent years that suggest food placed inside the tomb to help the dead body’s spiritual journey may actually have helped the breeding of microscopic spores which entered the explorer’s lungs when they opened the tomb. This highly volatile fungus, which would have developed uninhibited over 3000 years, then caused terrible fever and fatigue in the bodies it infected. Certainly, Lord Carnarvon, who was not in the best of health, would already have been tired from the long journey out to Egypt and would therefore be more susceptible to infection. But this theory does not totally explain the supposed curse, because very few of the people who were actually on hand died early. Of the 26 people present at the opening of the burial chamber, only six died in the following ten years. At the sarcophagus opening, 22 were present, of whom six died within a decade, while nobody who helped unwrap the mummified body suffered an early death. Carter himself, at the forefront of all the discoveries, died of natural causes at the age of 66. 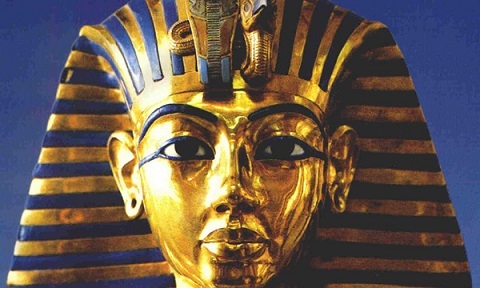 However, Carnarvon was the one who funded the search, was and the first on site for the opening so it may be possible that Tutenkhamun focused his ire directly on him. It is certainly true that Cairo’s hospital’s lights failed at the time of his death, and the story about his dog has never been disproved. One final fascinating rumour was that Carnarvon had given Carter a pet canary as a token of good luck to find the tomb. On the day of its discovery, it is said that a cobra – an animal symbolic of pharaohs – ate the bird. In fact, Carter had it kept alive and well, although it did pass into the possession what could be thought of as another kind of snake – he gave it to a bank manager! One of the greatest discoveries in the history of archaeology was made last summer, off Japan There, spread over an amazing 311 miles on the ocean floor, are the well-preserved remains of an ancient city. Or at the very least, a number of closely related sites. A structure thought to be the world's oldest building, nearly twice the age of the great pyramids of Egypt, has been discovered. The rectangular stone ziggurat under the sea off the coast of Japan could be the first evidence of a previously unknown Stone Age civilisation, say archaeologists. The monument is 600ft wide and 90ft high and has been dated to at least 8000BC. The oldest pyramid in Egypt, the Step Pyramid at Saqqara, was constructed more than 5,000 years later. The structure off Yonaguni, a small island southwest of Okinawa, was first discovered 75ft underwater by scuba divers 10 years ago and locals believed it was a natural phenomenon. Professor Masaki Kimura, a geologist at Ryukyu University in Okinawa, was the first scientist to investigate the site and has concluded that the mysterious five-layer structure was man-made. "The object has not been manufactured by nature. If that had been the case, one would expect debris from erosion to have collected around the site, but there are no rock fragments there," he said. In the waters around Okinawa and beyond to the small island of Yonaguni, divers located eight separate locations beginning in March 1995. The discovery of what appears to be a road surrounding the building was further evidence that the structure was made by humans, he added. That first sighting was equivocal - a provocative, squared structure, so encrusted with coral that its manmade identity was uncertain. Then, as recently as the summer of 1996, a sports diver accidentally discovered a huge, angular platform about 40 feet below the surface, off the southwestern shore of Okinawa. The feature’s artificial provenance was beyond question. Widening their search, teams of more divers found another, different monument nearby. Then another, and another. They beheld long streets, grand boulevards, majestic staircases, magnificent archways, enormous blocks of perfectly cut and fitted stone - all harmoniously welded together in a linear architecture unlike anything they had ever seen before. In the following weeks and months, Japan’s archaeological community joined the feeding-frenzy of discovery. Trained professionals formed a healthy alliance with the enthusiasts who first made the find. In a progressive spirit of mutual respect an working alliance, academics and amateurs joined forces to set an example of cooperation for the rest of the world. Their common cause soon bore rich fruit. In September, not far from the shore of the island of Yonaguni, more then 300 airline miles south from Okinawa, they found a gigantic, pyramidal structure in 100 feet of water. In what appeared to be a ceremonial center of broad promenades and flanking pylons, the gargantuan building measures 240 feet long. Exceptionally clear sub-surface clarity, with 100 foot visibility a common factor, allowed for thorough photographic documentation, both still photography and video. These images provided the basis of japan’s leading headlines for more than a year. Robert Schoch, professor of geology at Boston University, dived at the site last month. "It basically looks like a series of huge steps, each about a metre high. Essentially, it's a cliff face like the side of a stepped pyramid. It's a very interesting structure," he said. "It's possible that natural water erosion combined with the process of cracked rocks splitting created such a structure, but I haven't come across such processes creating a structure as sharp as this." Further evidence that the structure is the work of humans came with the discovery of smaller underwater stone mounds nearby. Like the main building, these mini-ziggurats are made of stepped slabs and are about 10m wide and 2m high. Kimura said it was too early to know who built the monument or its purpose. "The structure could be an ancient religious shrine, possibly celebrating an ancient deity resembling the god Nirai-Kanai, whom locals say gave happiness to the people of Okinawa from beyond the sea. This could be evidence of a new culture as there are no records of a people intelligent enough to have built such a monument 10,000 years ago," he said. "This could only have been done by a people with a high degree of technology, probably coming from the Asian continent, where the oldest civilisations originate. There would have to have been some sort of machinery involved to have created such a huge structure." Whoever created the city, most of it apparently sank in one of the huge seismic events that this part of the Pacific Rim is famous for, Kimura said. The world's largest recorded tsunami struck Yonaguni Jima in April 1771 with an estimated height of more than 131 feet (40 meters), he noted, so such a fate might also have befallen the ancient civilization. Kimura said he has identified ten structures off Yonaguni and a further five related structures off the main island of Okinawa. In total the ruins cover an area spanning 984 feet by 492 feet (300 meters by 150 meters). The structures include the ruins of a castle, a triumphal arch, five temples, and at least one large stadium, all of which are connected by roads and water channels and are partly shielded by what could be huge retaining walls. Kimura believes the ruins date back to at least 5,000 years, based on the dates of stalactites found inside underwater caves that he says sank with the city. And structures similar to the ruins sitting on the nearby coast have yielded charcoal dated to 1,600 years ago—a possible indication of ancient human inhabitants, Kimura added. But more direct evidence of human involvement with the site has been harder to come by. "Pottery and wood do not last on the bottom of the ocean, but we are interested in further research on a relief at the site that is apparently painted and resembles a cow," Kimura said. "We want to determine the makeup of the paint. I would also like to carry out subsurface research." Teruaki Ishii, professor of geology at Tokyo University, said the structure dated back to at least 8000BC when the land on which it was constructed was submerged at the end of the last ice age. "I hope this site is artificial as it would be very exciting. But at this time I feel it is too early to say. I think the structure could be natural, but part of it may have been made," he said. The first signs of civilisation in Japan are traced to the Neolithic period around 9000BC. The people at this time lived as hunters and food- gatherers. There is nothing in the archaeological record to suggest the presence of a culture advanced enough to have built a structure like the ziggurat. British archaeologists are, however, cautiously enthusiastic about the discovery which will be featured this summer in a Channel 4 documentary. Jim Mower, an archaeologist at University College London, said: "If it is confirmed that the site is as old as 10,000 years and is man-made, then this is going to change an awful lot of the previous thinking on southeast Asian history. It would put the people who made the monument on a par with the ancient civilisation of Mesopotamia and the Indus Valley." Yet, not a word about the Okinawa discovery reached the US public, until the magazine, “Ancient American” broke the news last spring. Since that scoop, only the CNN network televised a report about Japan’s underwater city. Nothing about it has been mentioned in any of the nation’s other archaeology publications, not even in any of our daily newspapers. One would imagine that such a mind-boggling find would be the most exciting piece of news an archaeologist could possibly hope to learn. Even so, outside of the “Ancient American” and CNN’s single report, the pall of silence covering all the facts about Okinawa’s structures screens them from view more effectively then their location at the bottom of the sea. Why? How can this appalling neglect persist in the face of a discovery of such unparalleled magnitude? At the risk of accusations of paranoia, one might conclude that a real conspiracy of managed information dominates America’s well-springs of public knowledge.